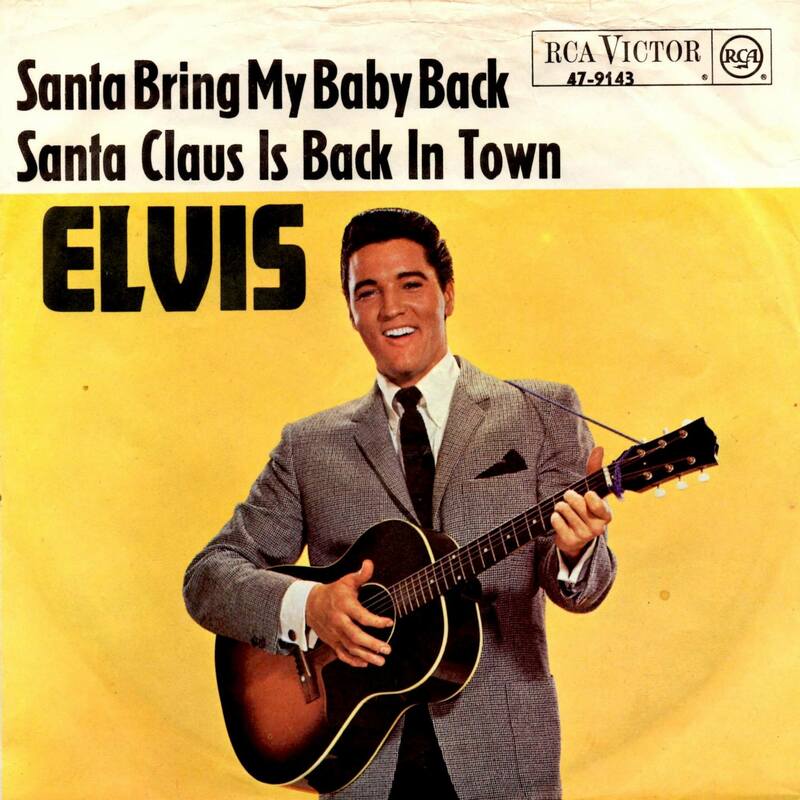 Santa Claus is back in town! 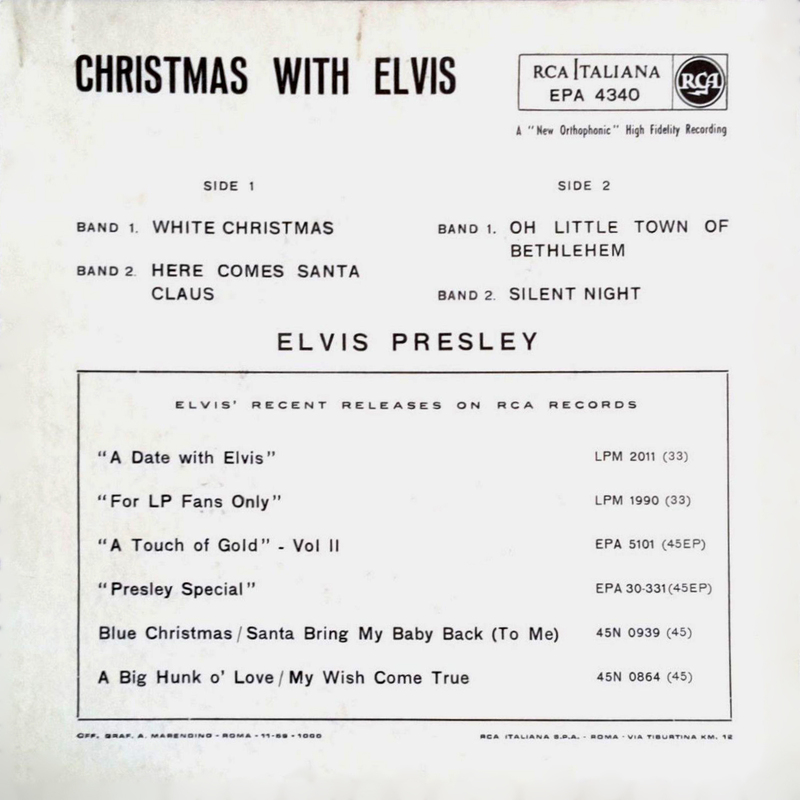 In this article we take a look at the worldwide releases of Elvis Presley’s Christmas recordings in the 50’s and 60’s. 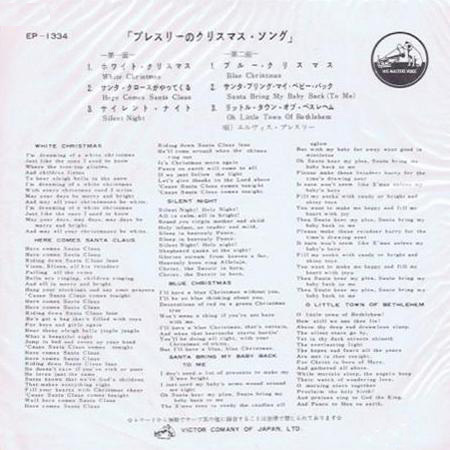 All releases that came with a picture cover are presented here. 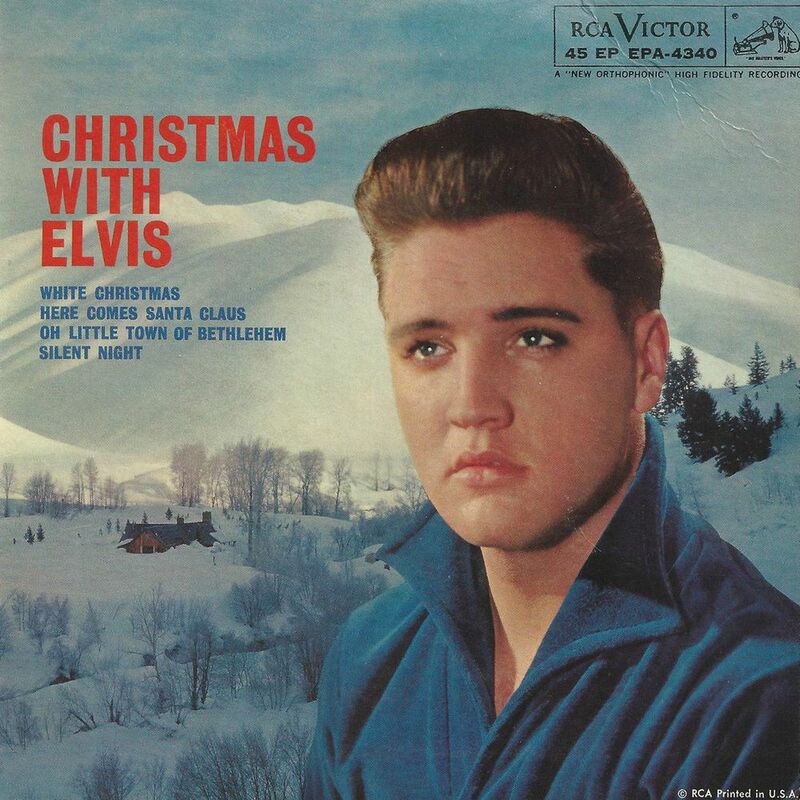 And there were some real beauties among them, many of which have become extremely rare and very collectible. 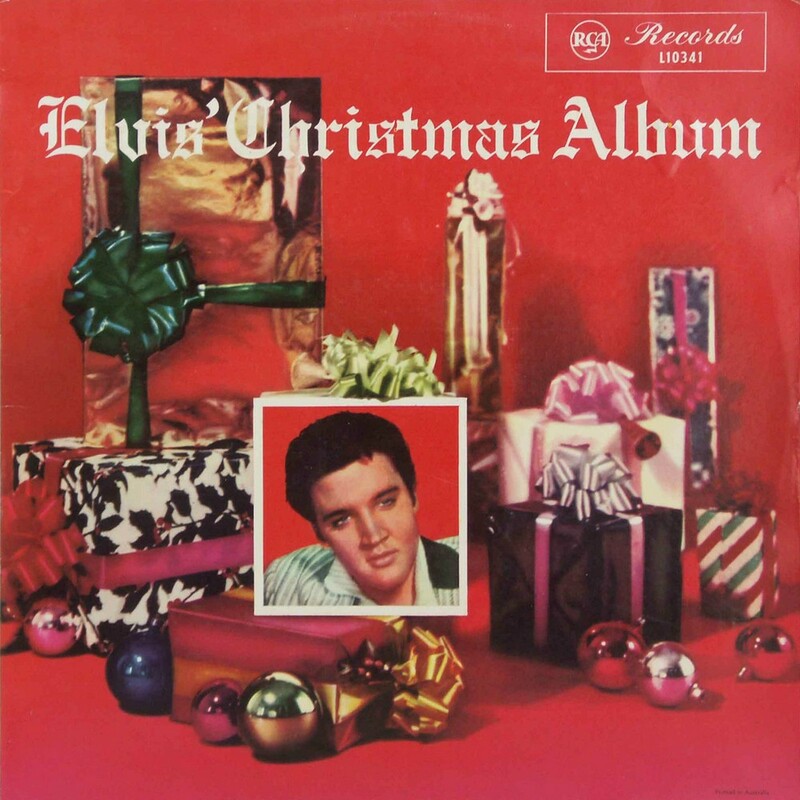 First up are the American releases, followed by all other worldwide releases in alphabetical order. 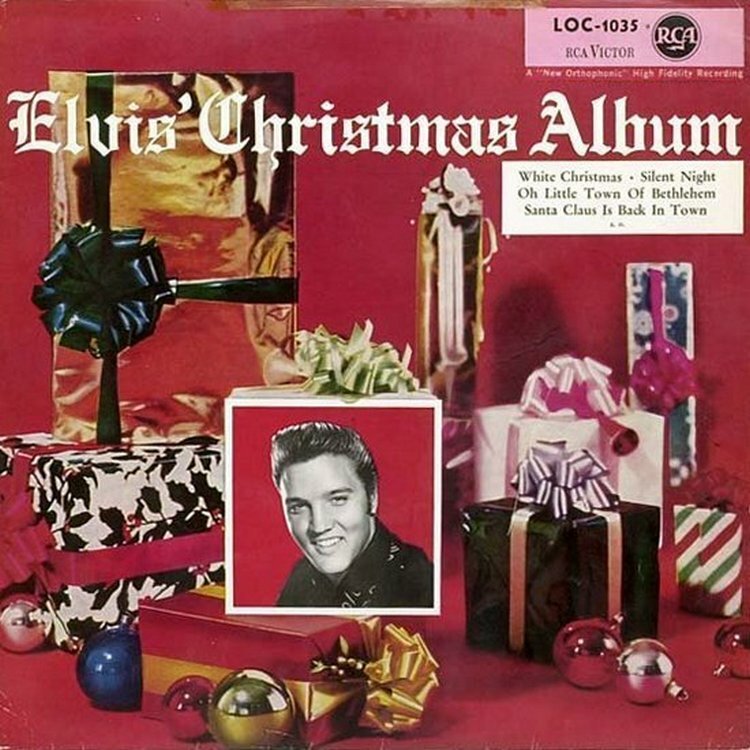 This deluxe release from 1957 was a true work of art! 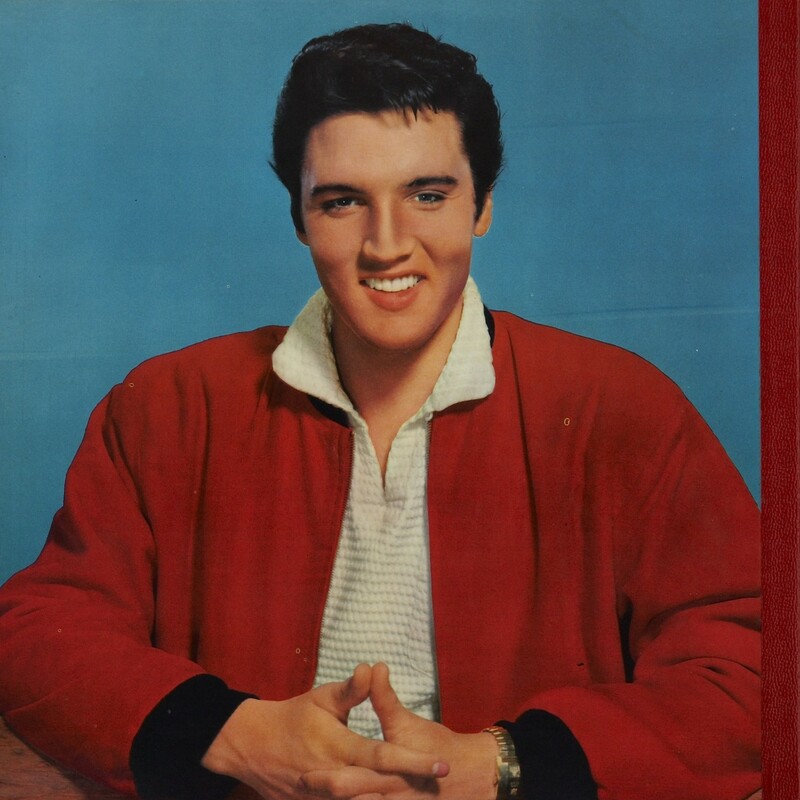 The beautiful fold-out cover opened up into a booklet that was loaded with cool color photos. 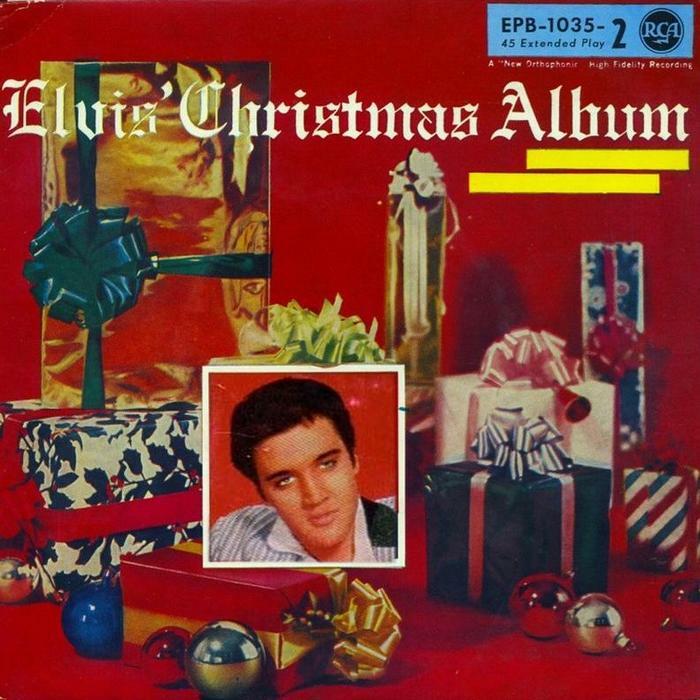 Elvis’ Christmas Album was an instant classic, and it would return to the charts for many years to come. 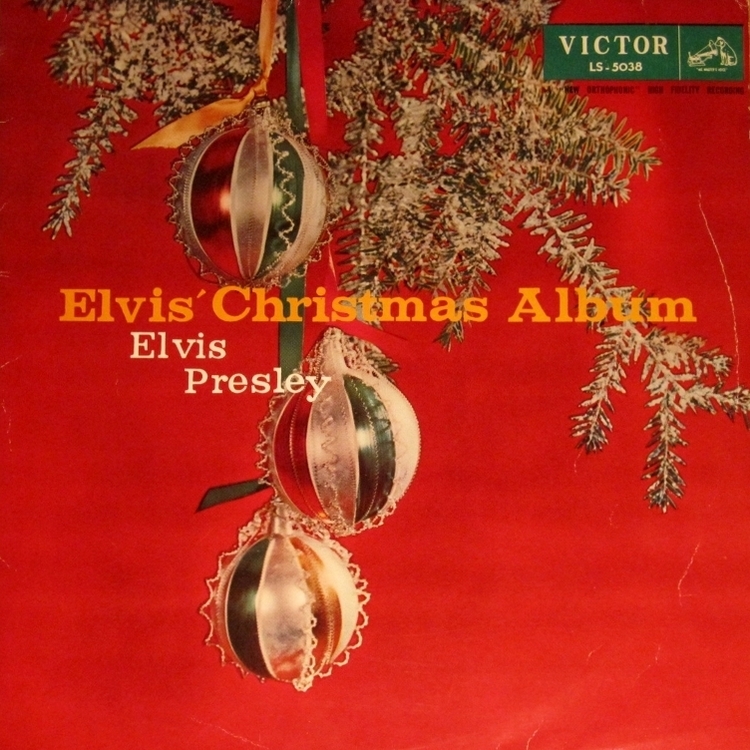 Also released in 1957, this EP contained half of the Christmas songs that could be found on the album. 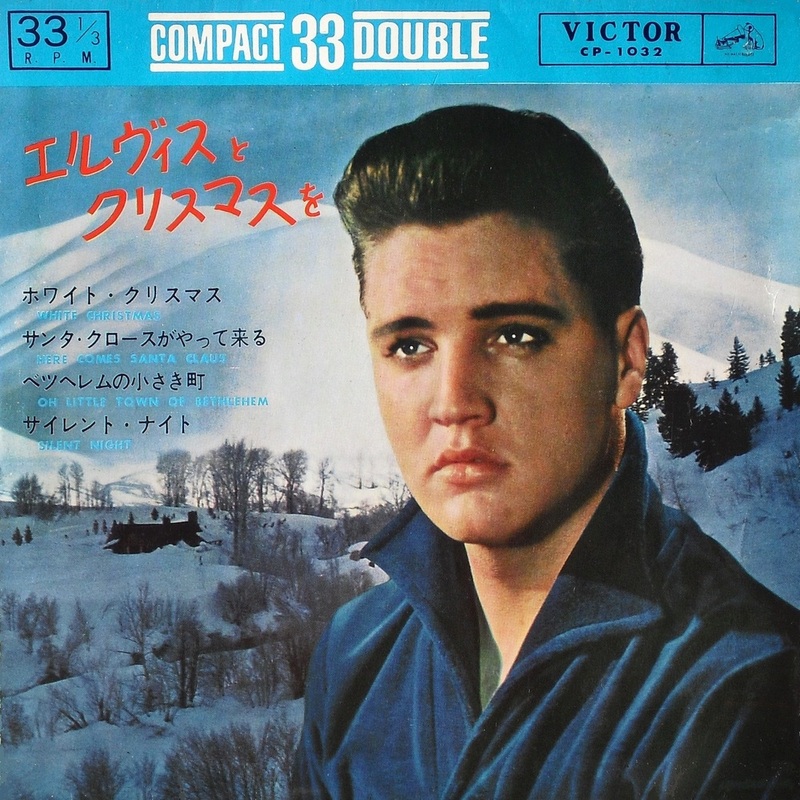 Two cover-variations of this title exist. 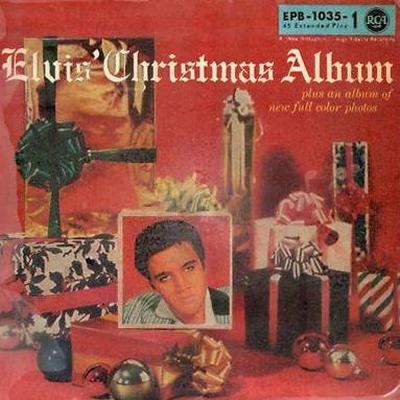 The later pressing did not mention the songtitles on the frontcover. 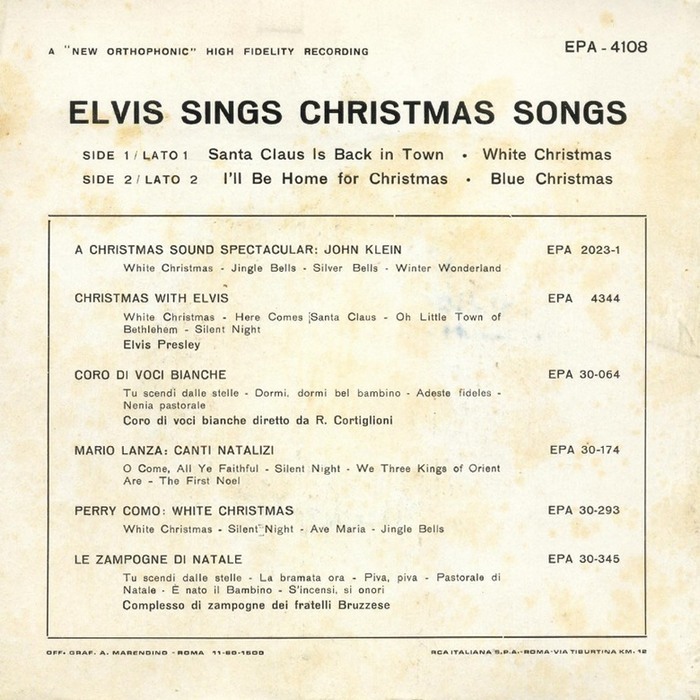 The 2nd Christmas EP, from 1959, consisted of the other half of the album songs. 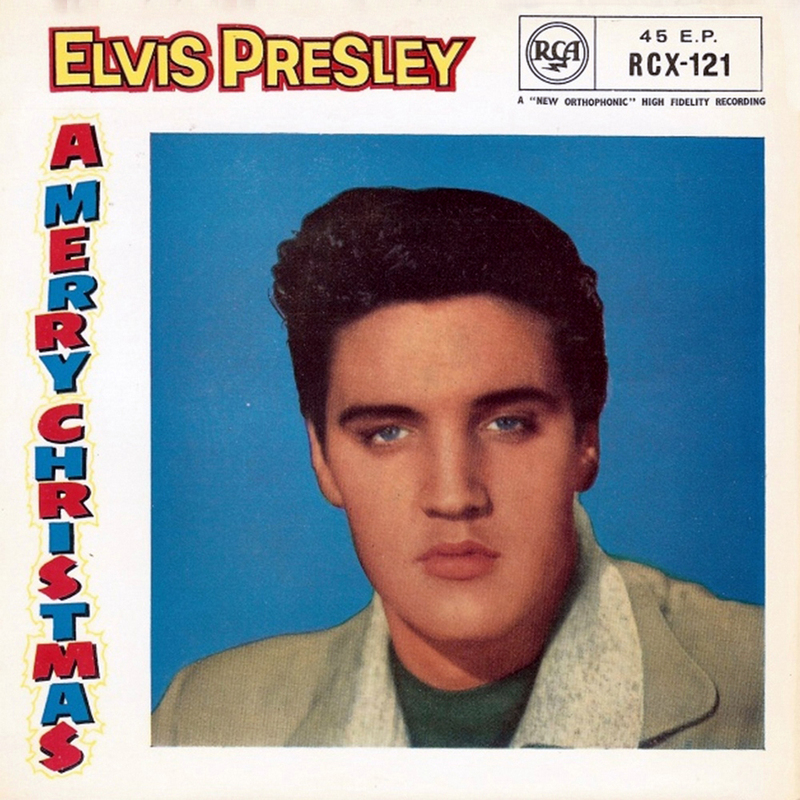 When the album was re-released in 1959, the artwork had changed dramatically. 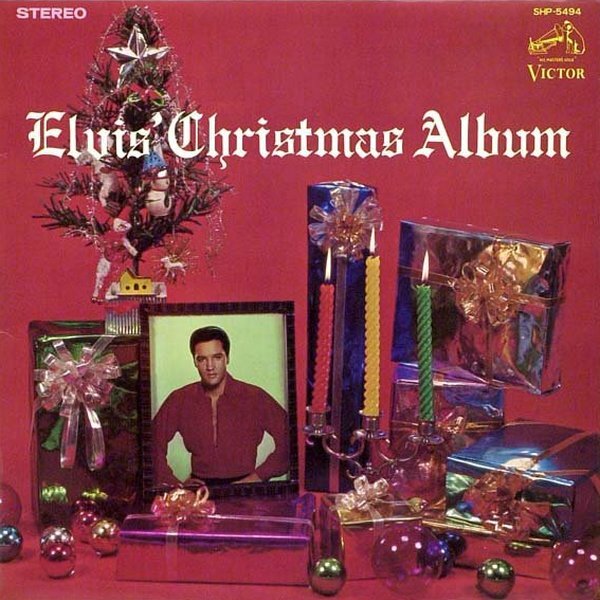 But once again a lot of effort seemed to have gone into the presentation of this album. 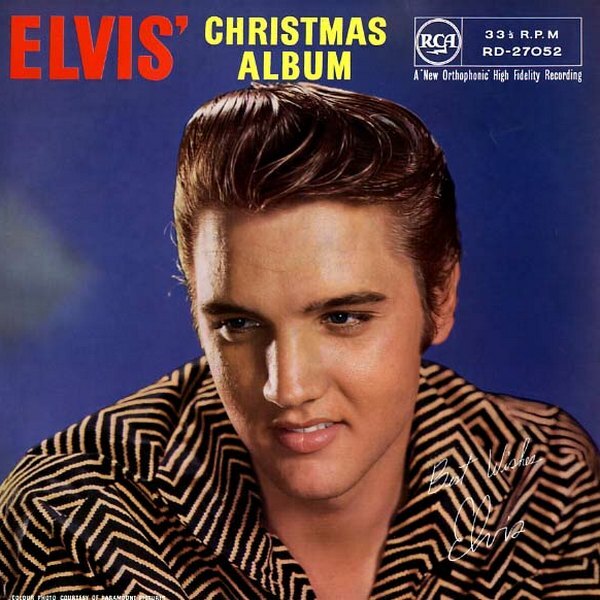 No new Elvis Christmas records would be released for the next 5 years. 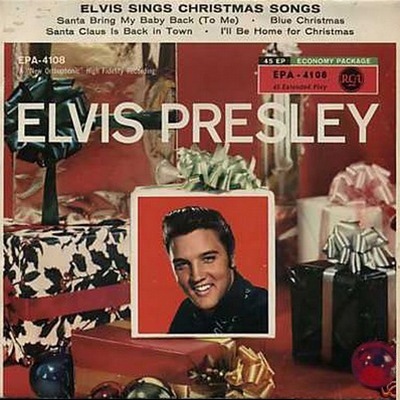 A single was released in 1964 which coupled two old songs, “By Popular Request”. 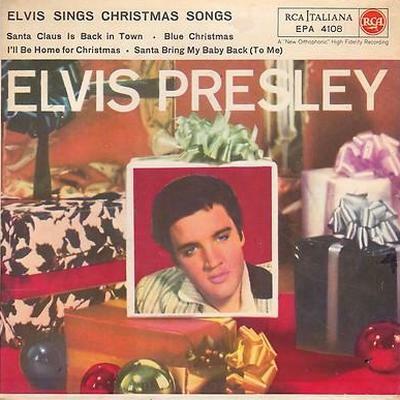 The cover artwork of this single was very original and deserves a special mention. 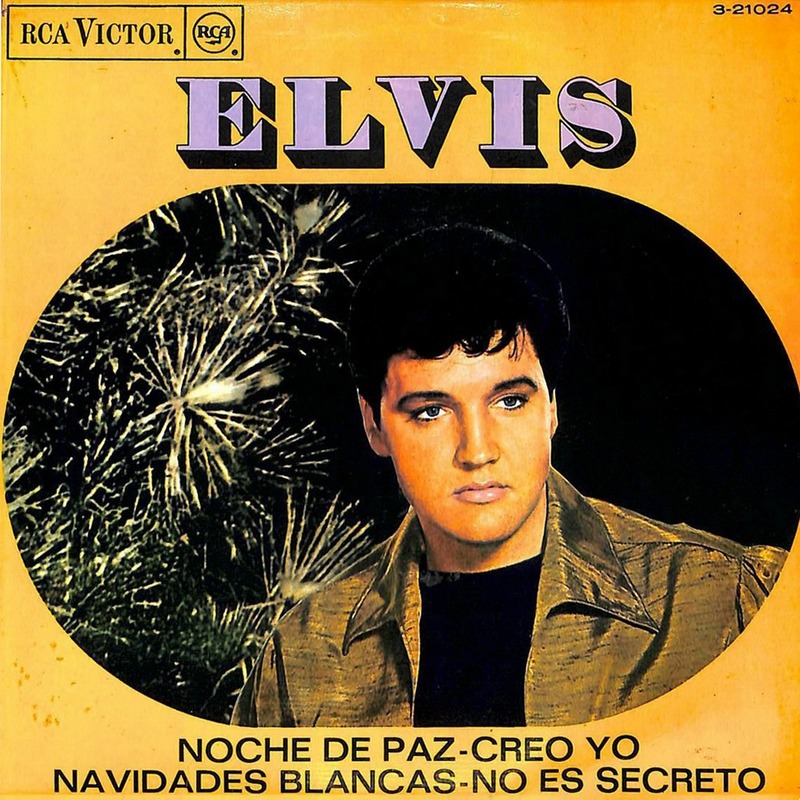 Also in 1964, the LP was re-released in Reprocessed Stereo. 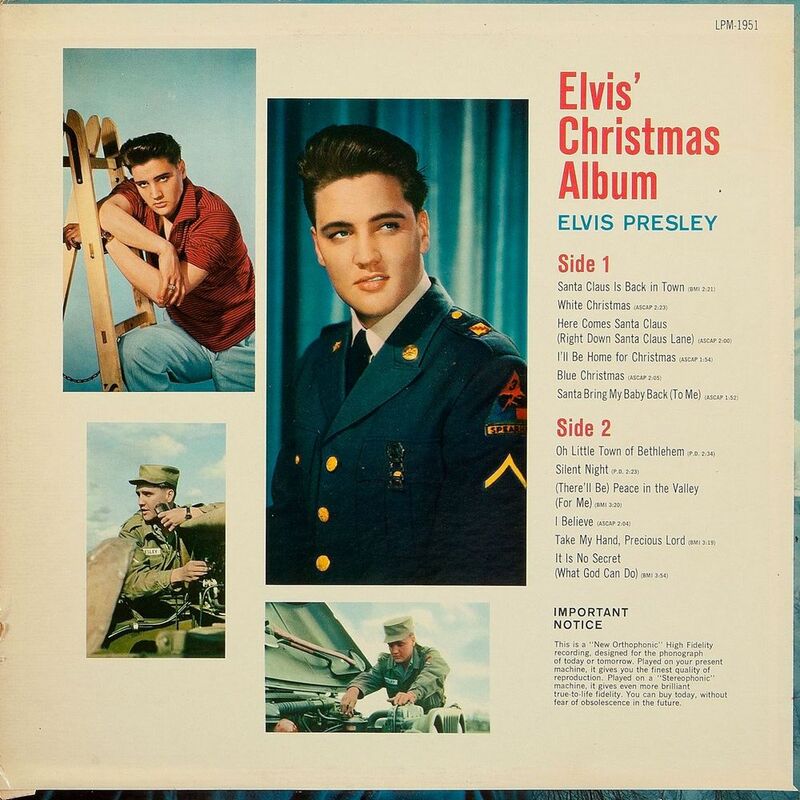 The army pics on the back cover were now gone while other Christmas and Gospel records were being advertised. 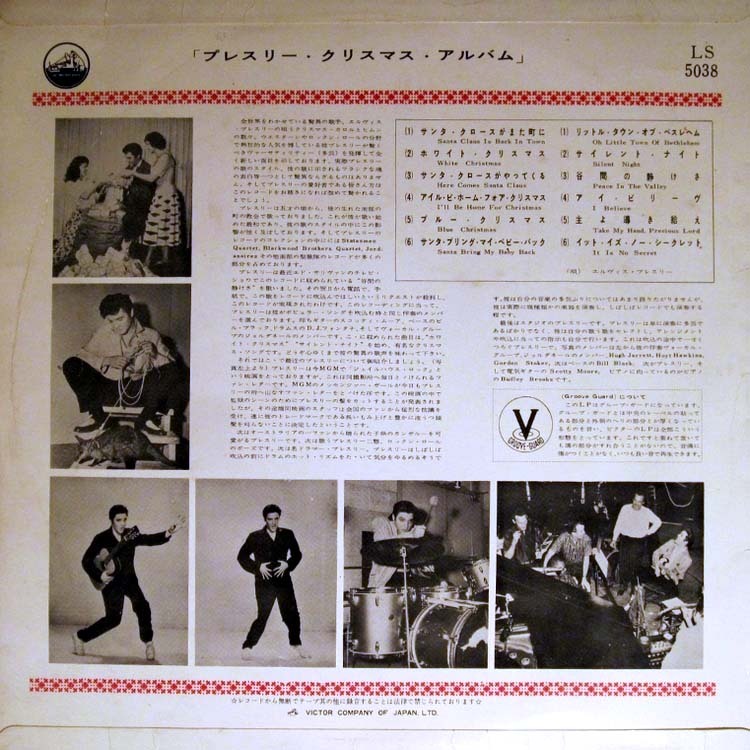 The mono version of this LP (LPM-1951) was also re-released with the new back cover. 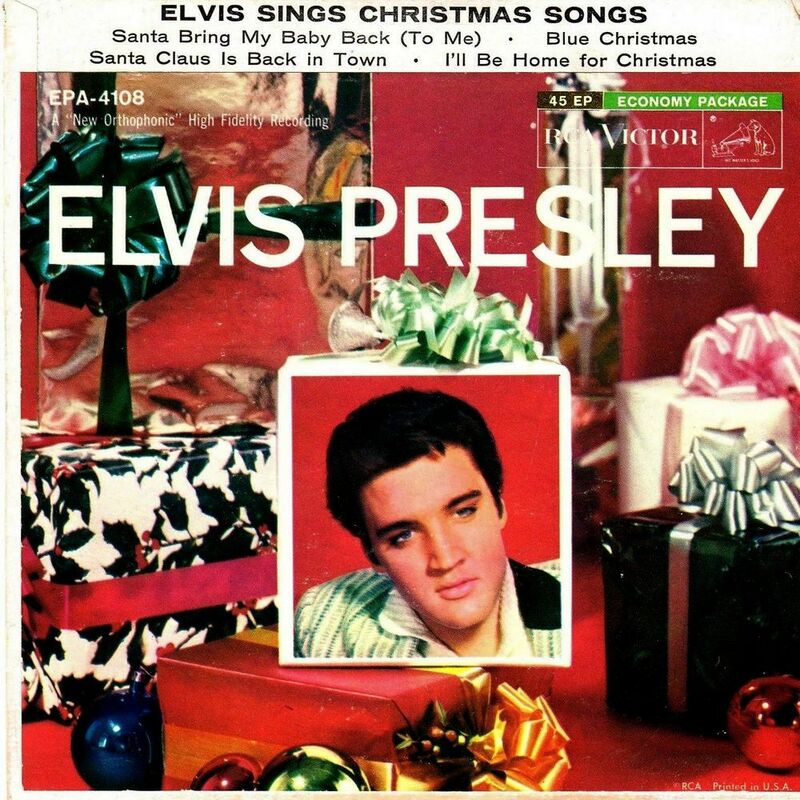 1965 saw the release of a Christmas single that didn’t make sense at all. 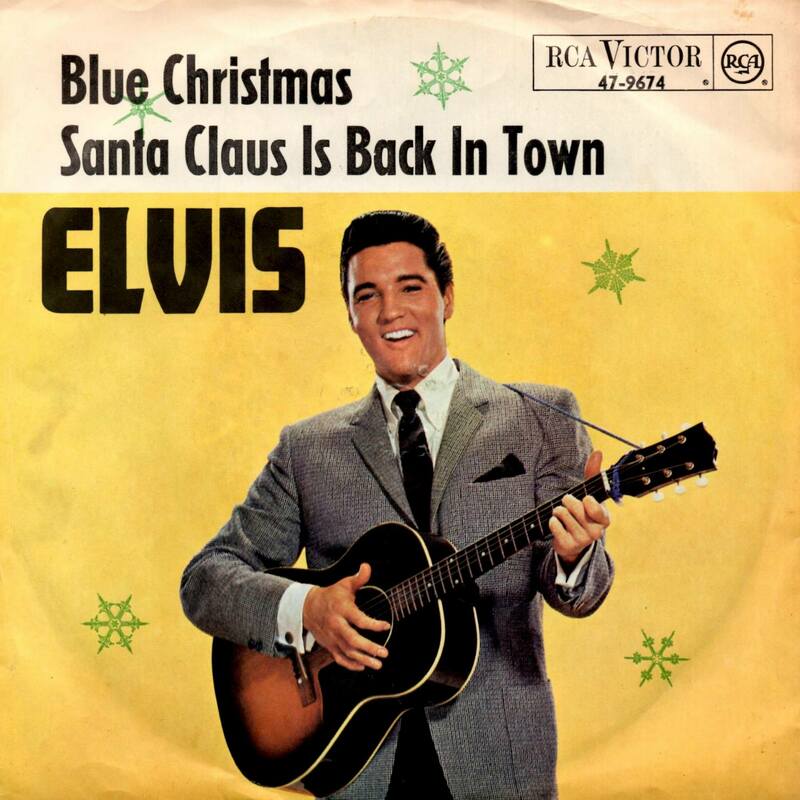 The cover was a straight copy of the 1964 single, while the song Blue Christmas had also already been used that previous year. 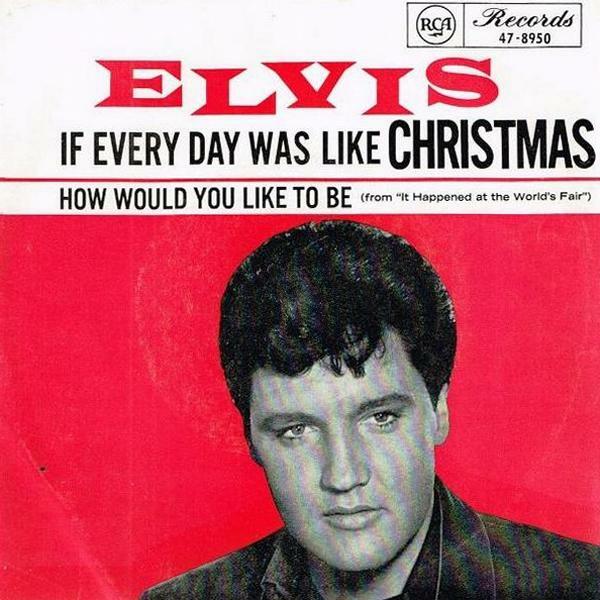 The last Christmas release in this decade was the first truly new Christmas song since 1957. 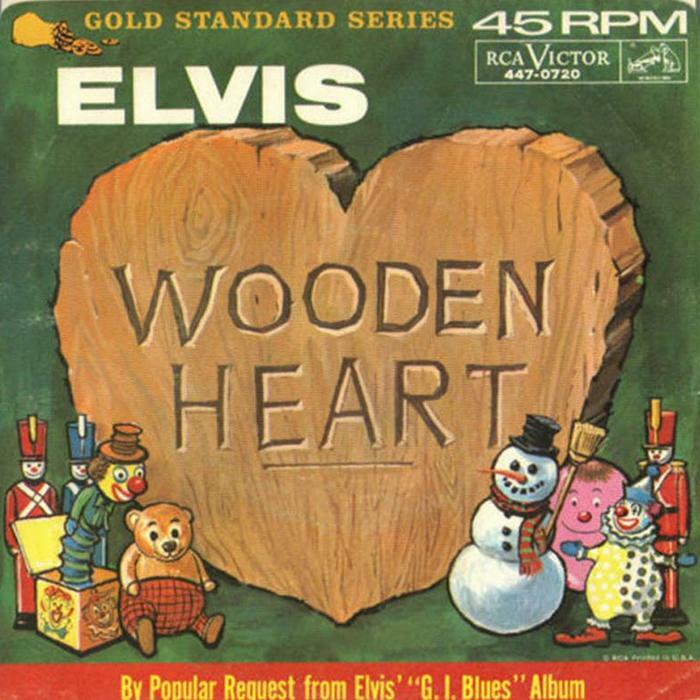 Released in 1966 and written by Red West, the tune was coupled with a children’s song that was recorded 4 years earlier. 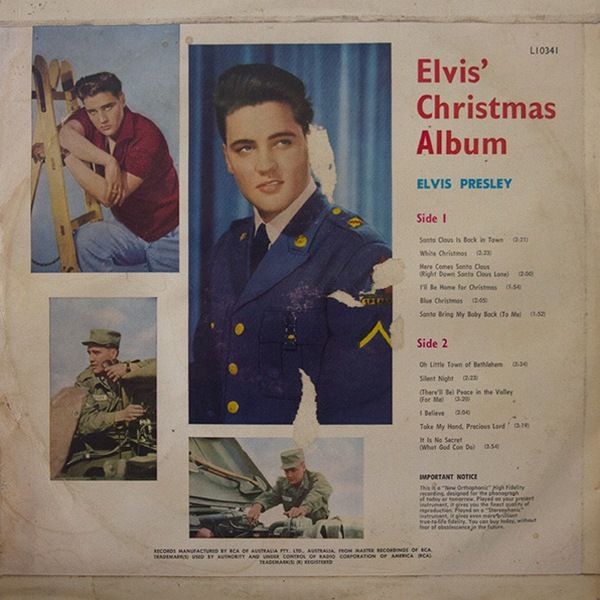 The front cover of the US album was also used for the Australian release in the 1950’s. There was however no fold-out cover with book of photos. 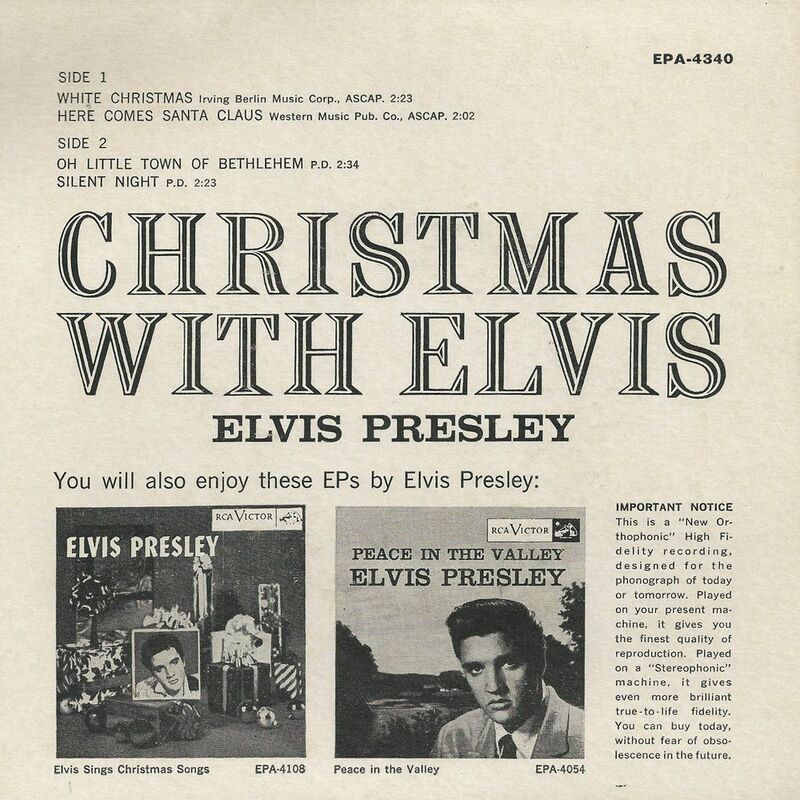 The back cover was also very different and included a nice story about the young Elvis Presley. 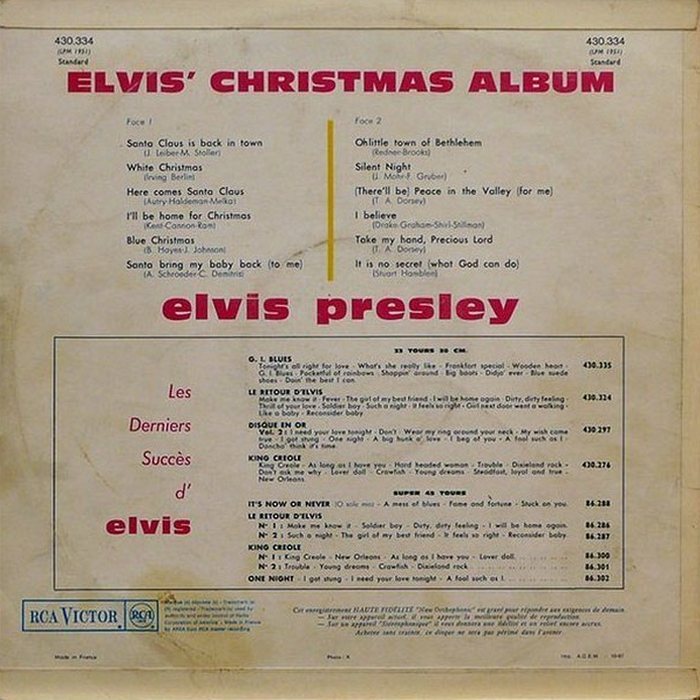 Released in 1958, this EP came with a different back cover compared to the US pressing. 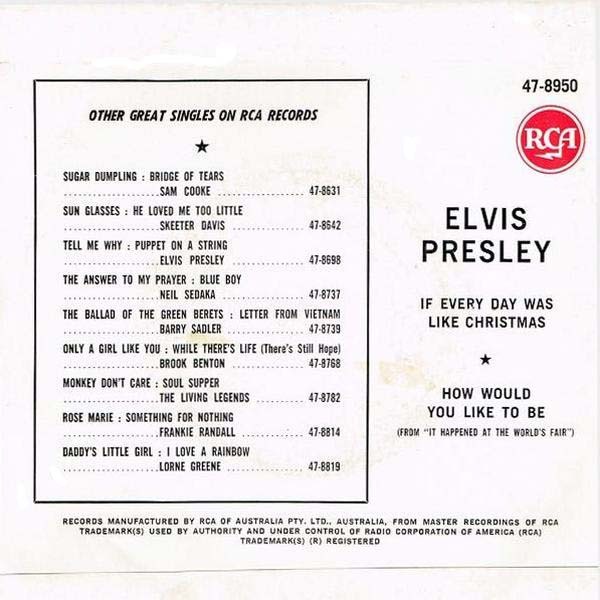 Also the 2nd Christmas EP was released in Australia, in 1959, and again with a different back cover. 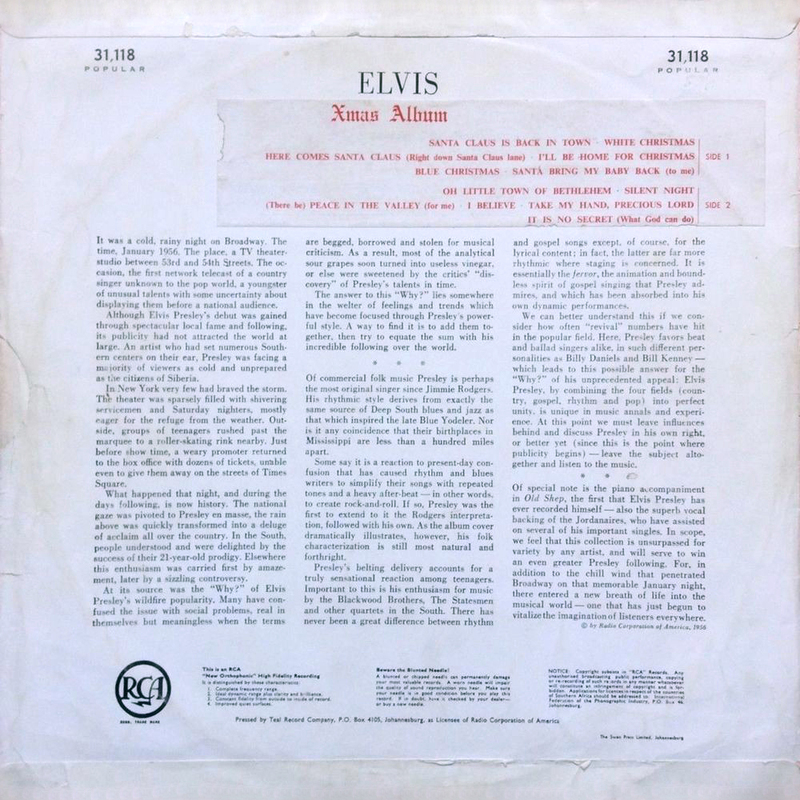 For the Australian re-release of the Christmas Album in 1964, the same beautiful front and back artwork was used as in ’59 in the USA. 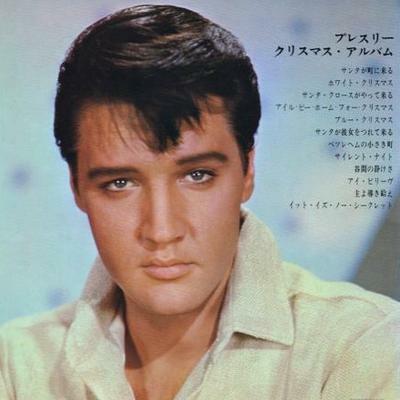 Though it must have been odd to see pics of Elvis that were 5 years old and from an era that was long gone by the mid 60’s. 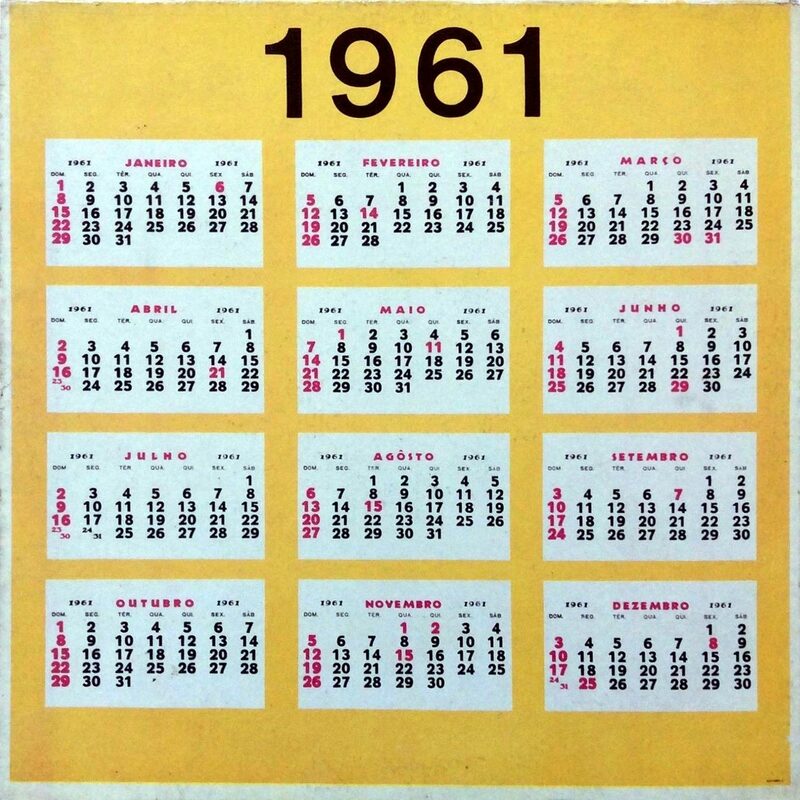 Different colors on the front, and a totally different back cover for this 1966 single. 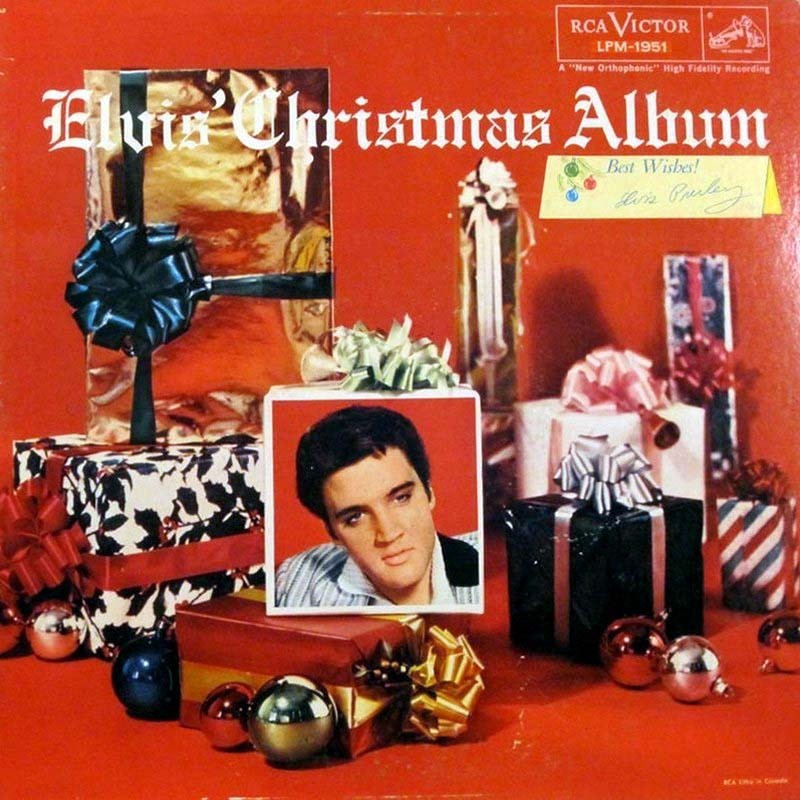 When re-released in 1967, this EP was asigned the orginal US catalog number, plus a complete new front-cover was chosen (the image of the How Great Thou Art album). 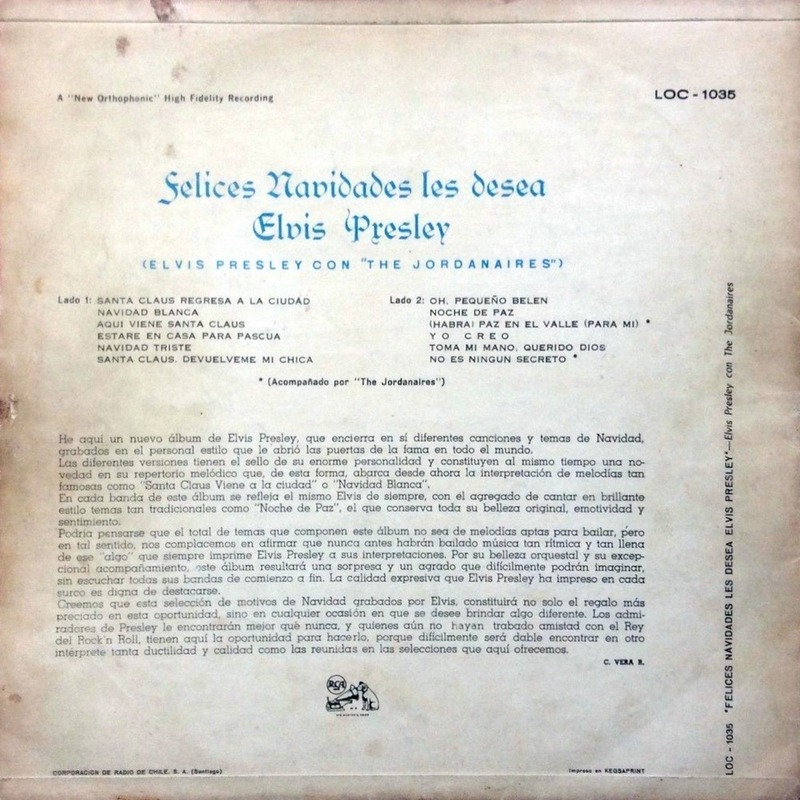 Here we have a rare pressing from Brazil, released with a gate-fold sleeve. 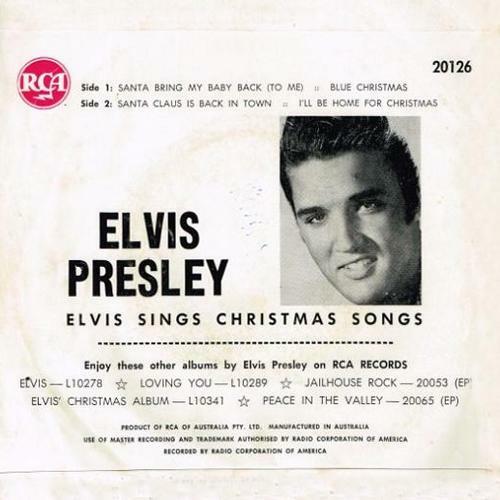 The image on the front also appeared in the booklet of the ’57 US album. 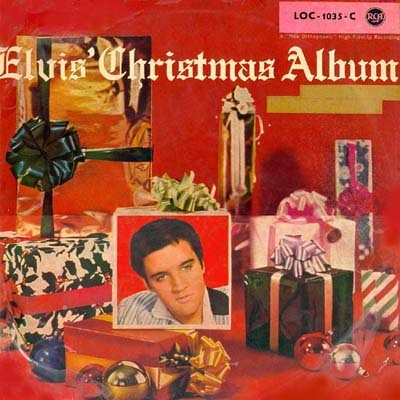 Going by the 1961 calendar on the back, this LP appears to be from 1960. 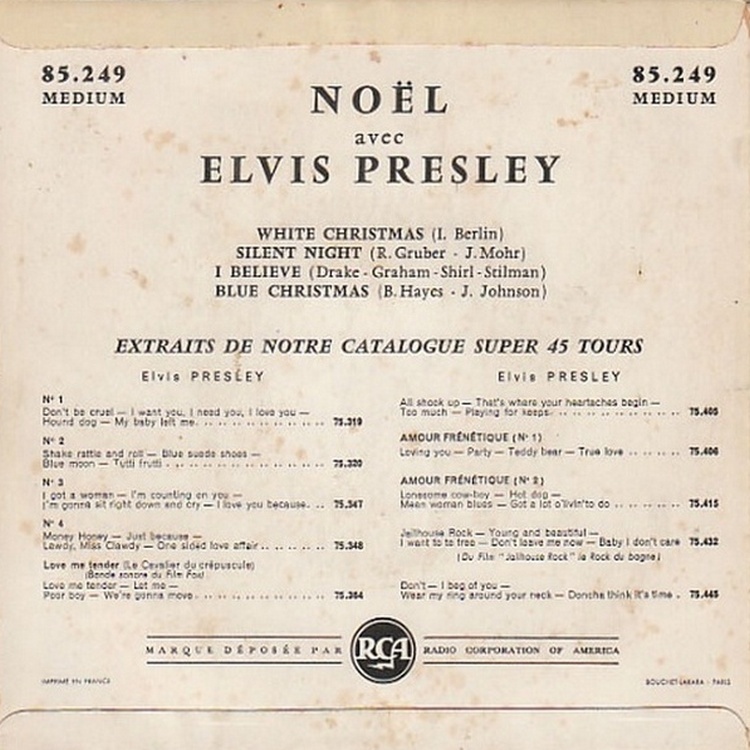 Released in 1958, there was no nice fold out cover for the Canadian fans, while the back cover was the most boring of all worldwide Christmas releases. 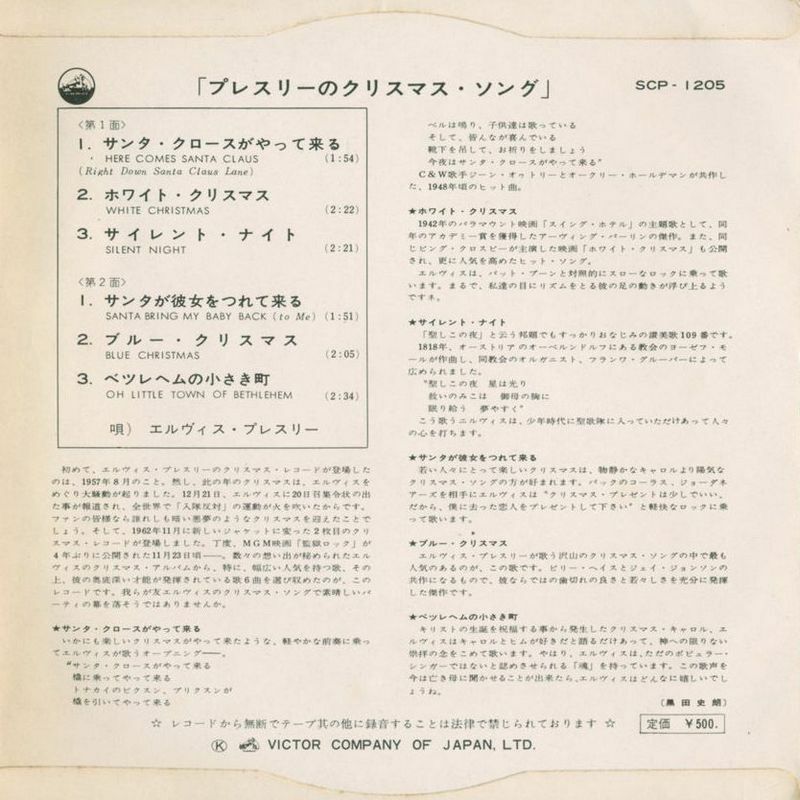 The text referring to the booklet was covered up by a “Best Wishes!” message. 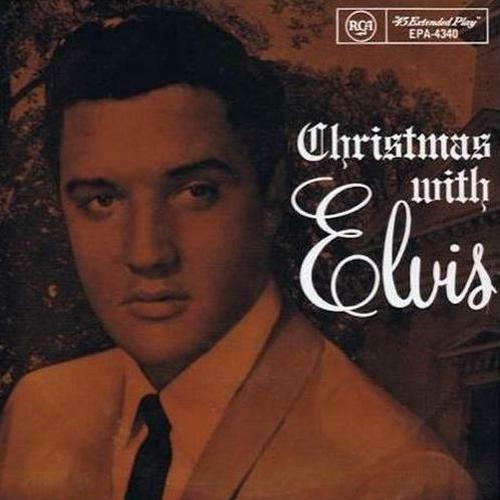 From 1957, a true rarity. 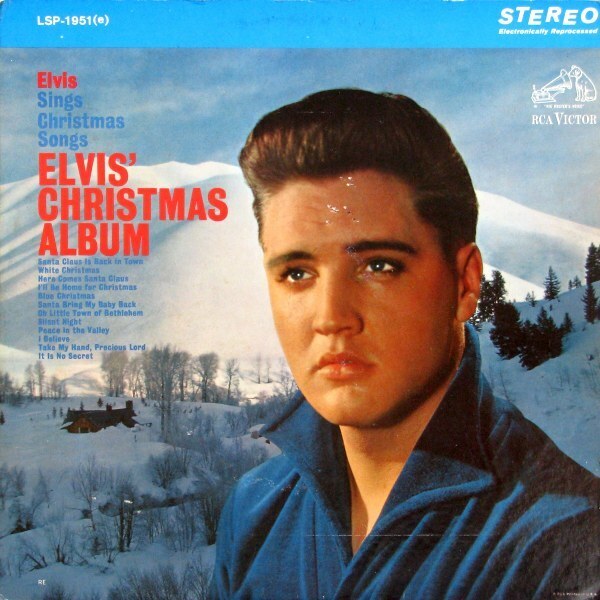 Pictured here is the 2nd pressing, which was released the same year. 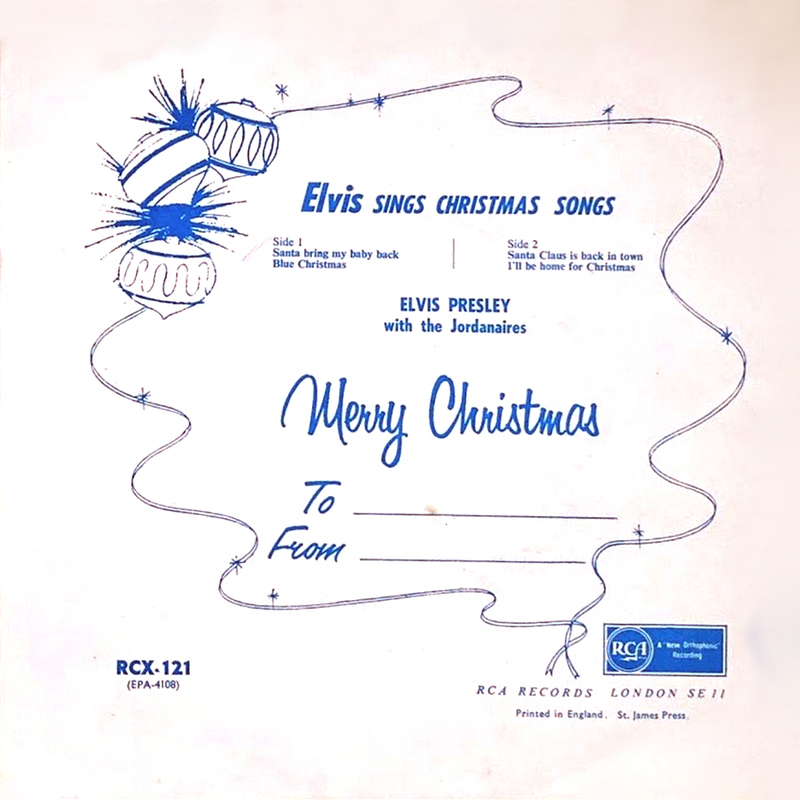 The two German EP’s (see below) were also released in Denmark in 1958, but unlike the Germans, the Danes too (like RCA Canada) had found a more effective way to cover up the message on the front: “Merry Christmas And Happy New Year”. 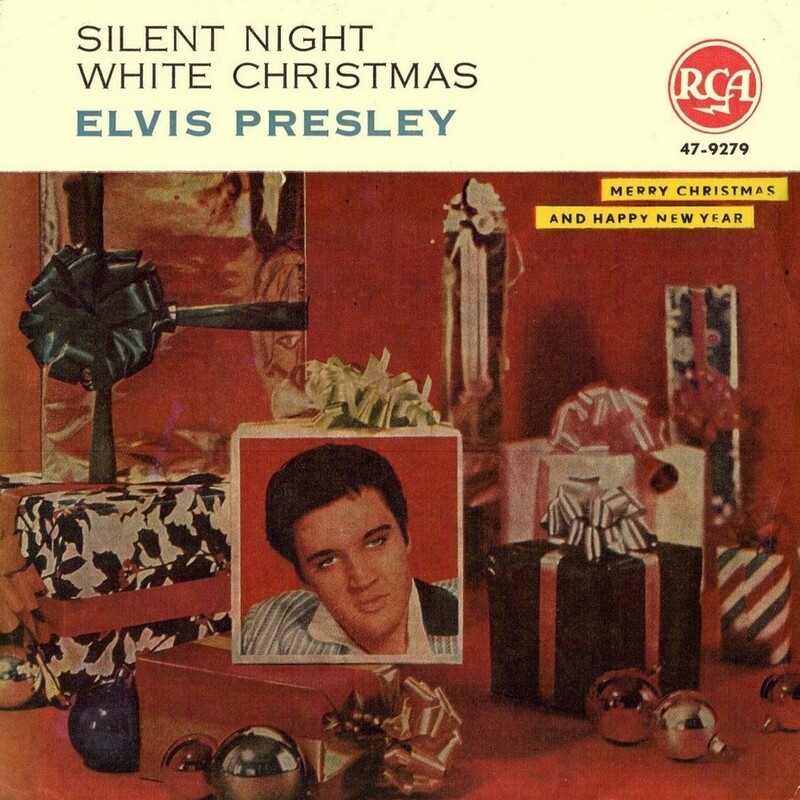 From 1964, an early German single that originally came without a cover. The Danes added a nice front insert. 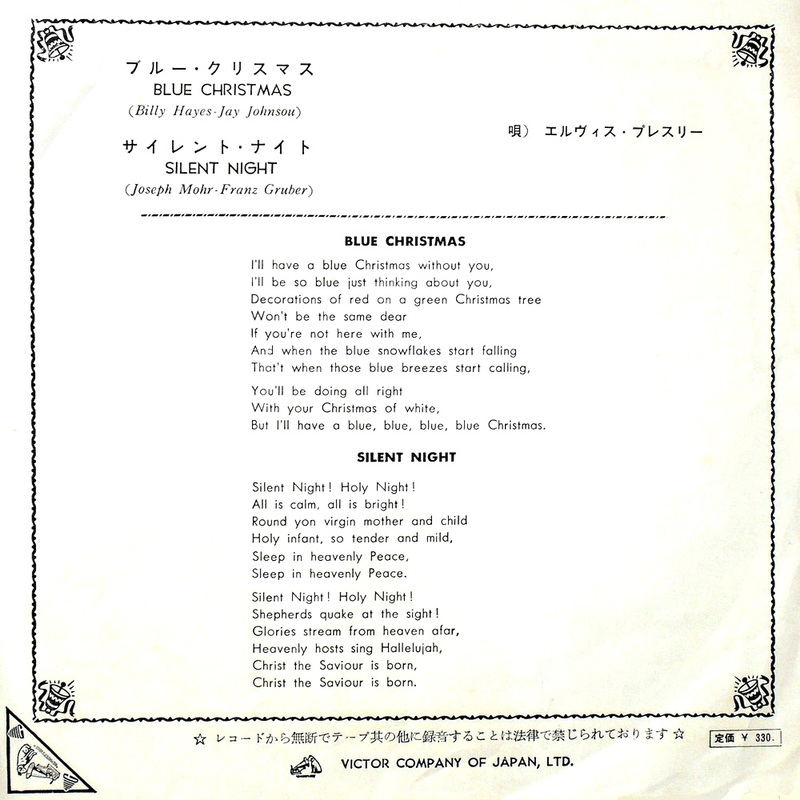 Since this single came with just a front insert (and no back cover), an image of the single is added for good measure. 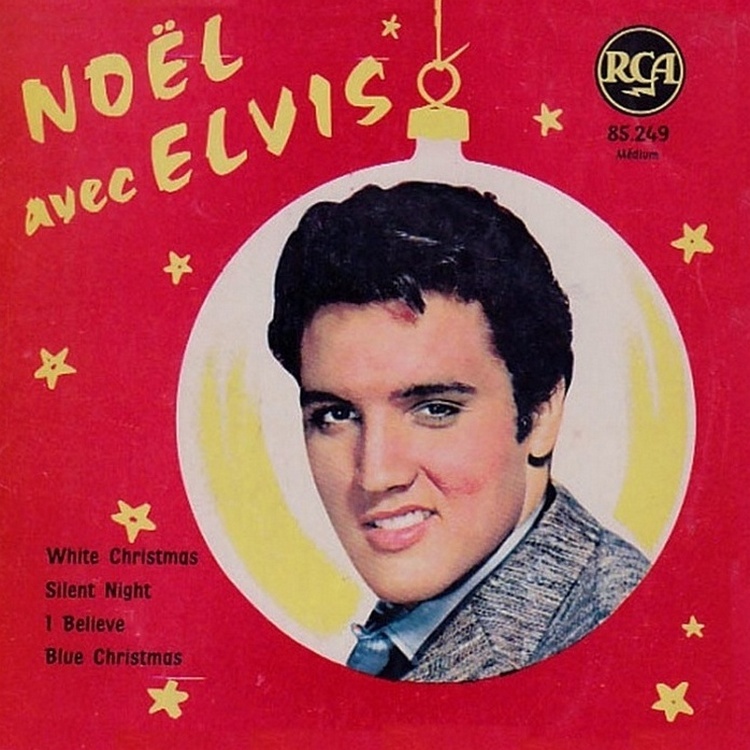 Another unique and very nice release, this time from RCA France: Christmas With Elvis, released in 1958. 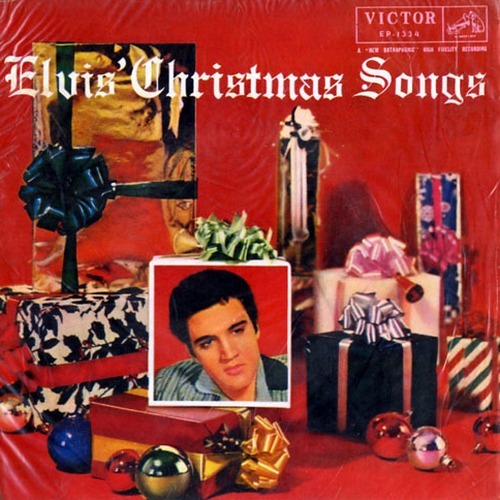 The Christmas album was released on numerous occasions in France. 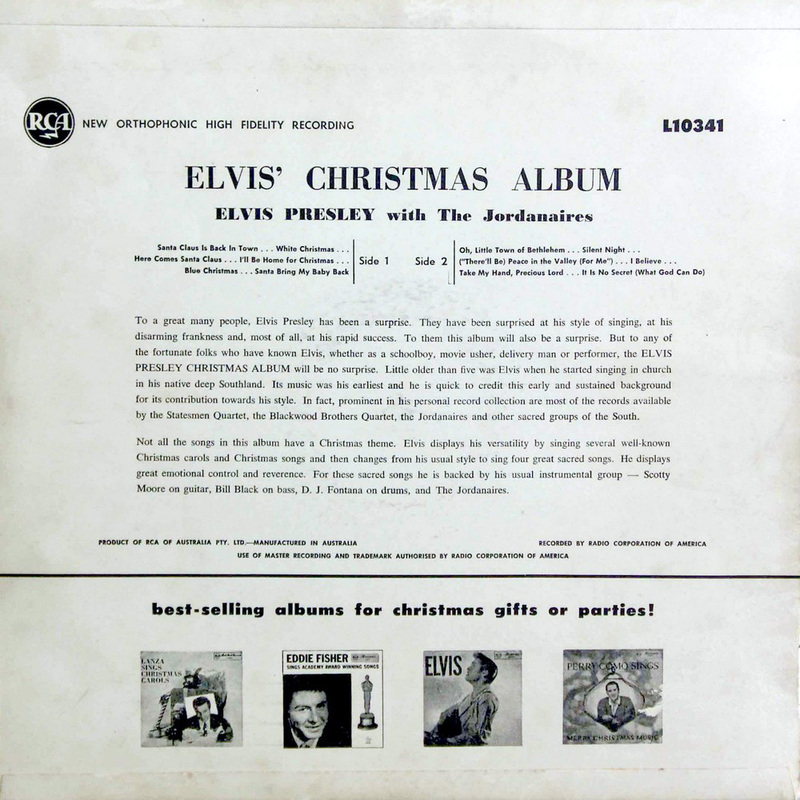 Here we have an early 1960’s pressing which came with a different back cover. 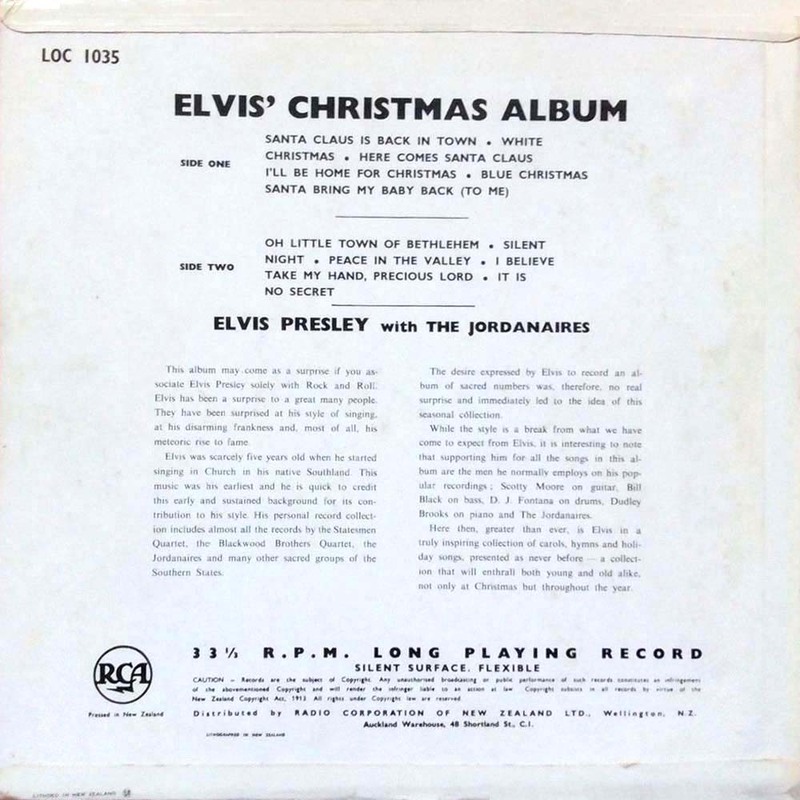 The German LP from 1957 did not come with the foldout cover and the “album of new full colour photos”, so RCA Germany covered the reference to the booklet with ugly yellow bars. Ouch! 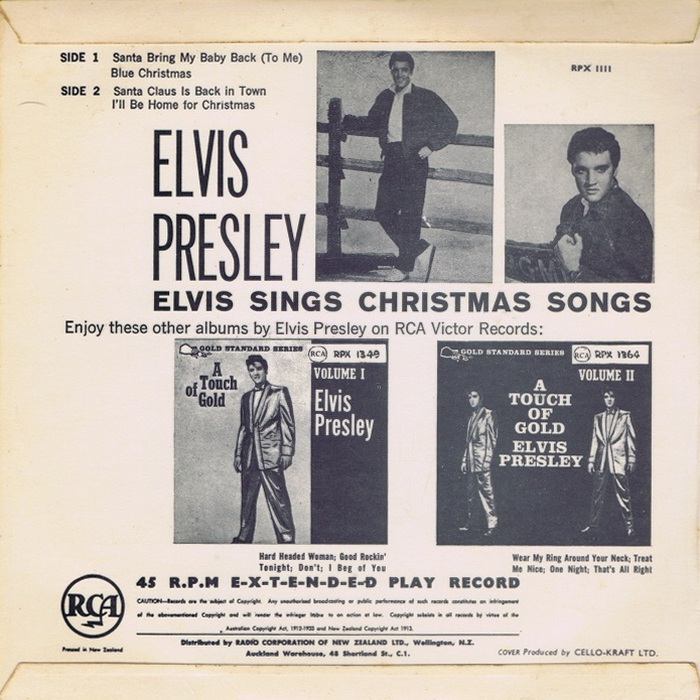 A page from the US booklet was used for the rather nice back cover. 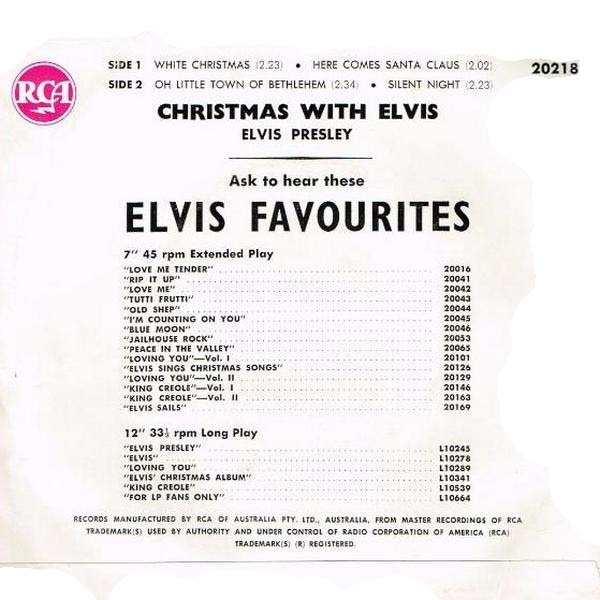 These two EP’s were released in 1958. 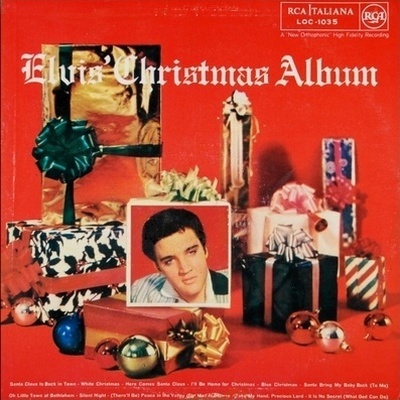 Each contained half of the 8 Christmas songs that were on the original LP. 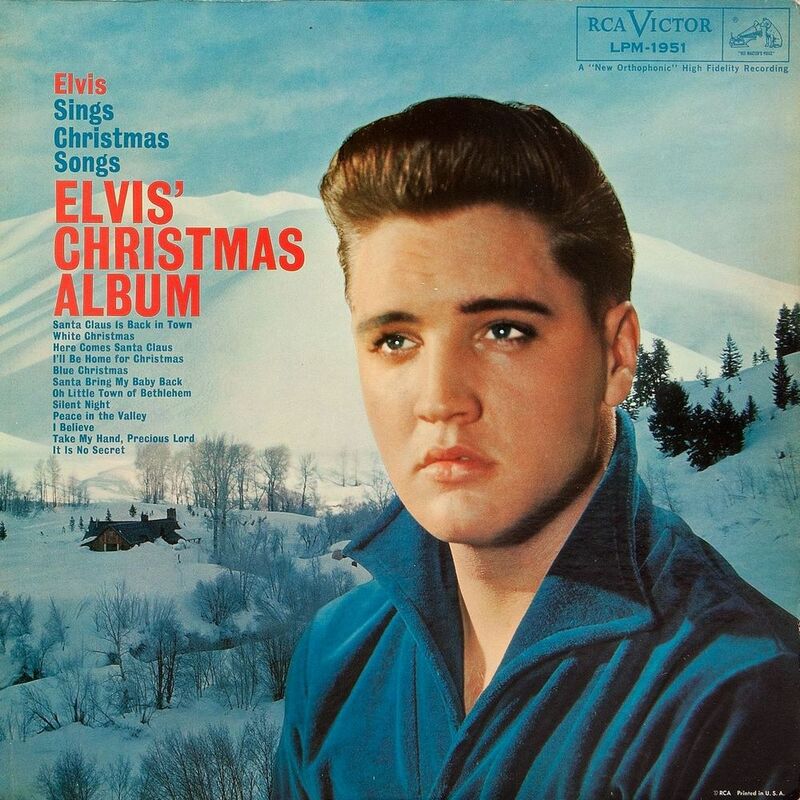 For the first pressing, RCA Germany failed to remove the obsolete “plus an album of new full colour photos”. 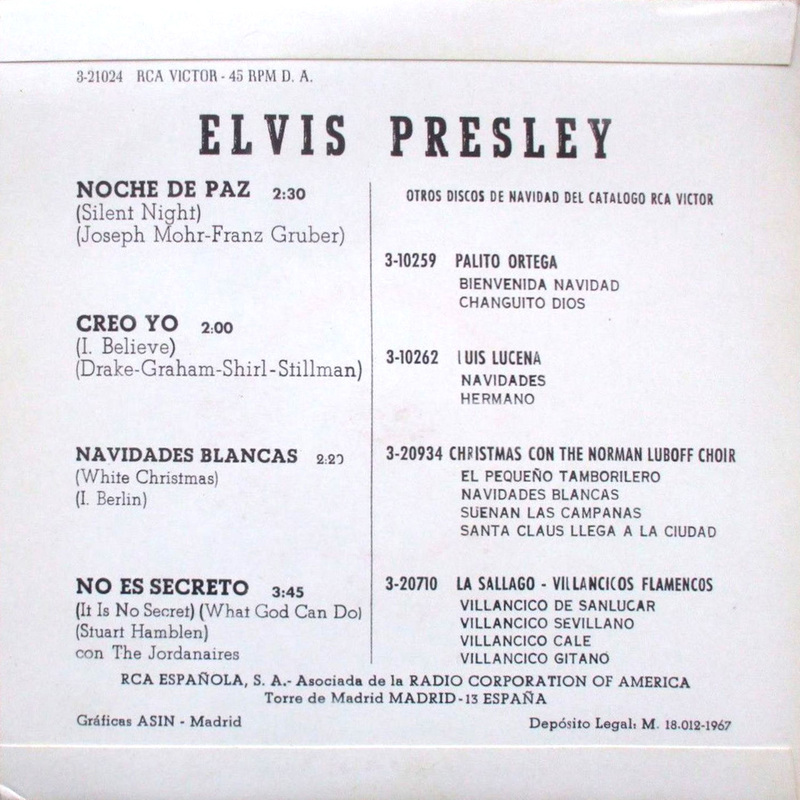 Here we have the corrected covers of these EP’s (also from 1958), with loud yellow bars now covering up the words. It makes you wonder why the German art-department did not use the colour red to cover up the words. Photoshop was obviously still far, far away. 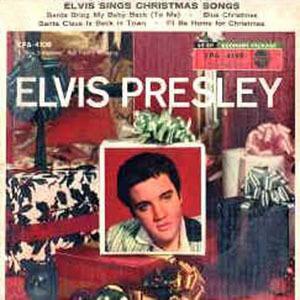 The two EP’s were re-released in 1964 and a different photo of Elvis now graced the cover. 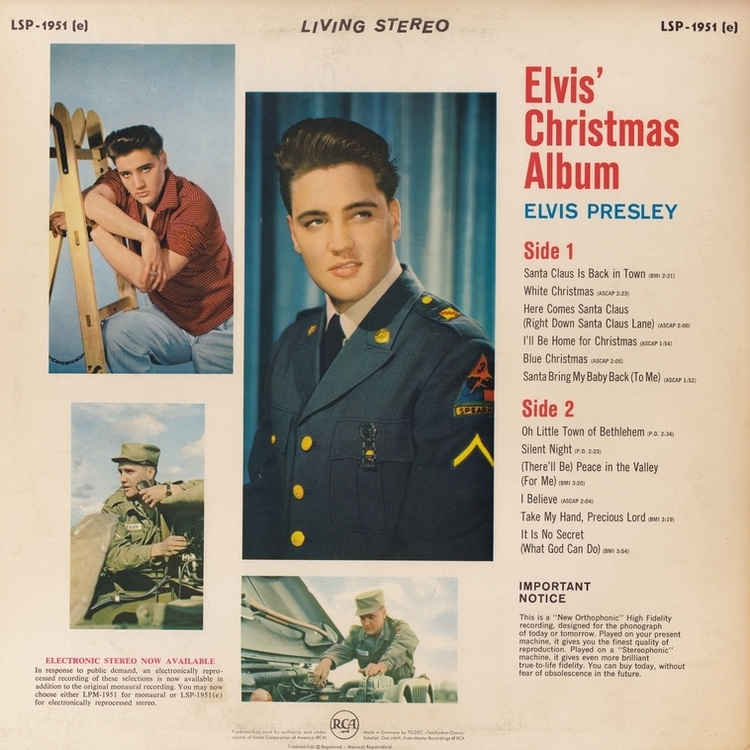 The backcovers of all pressings of these two EP’s were nearly identical and resembled the backcover of the German album (LOC-1035-C). 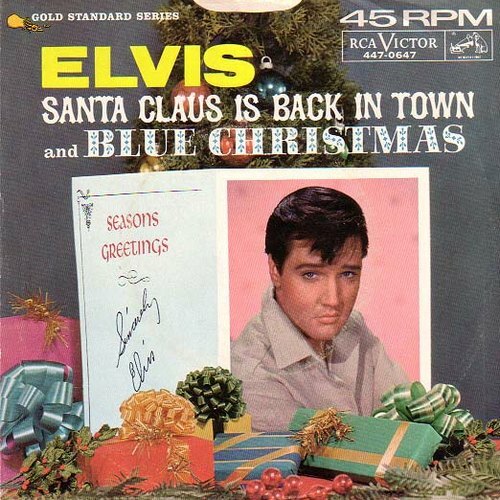 This EP was released in 1959. 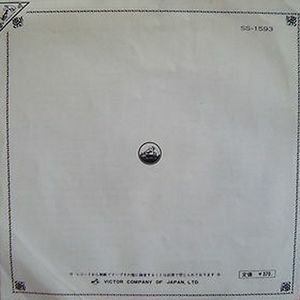 The cover was the same as the US pressing. 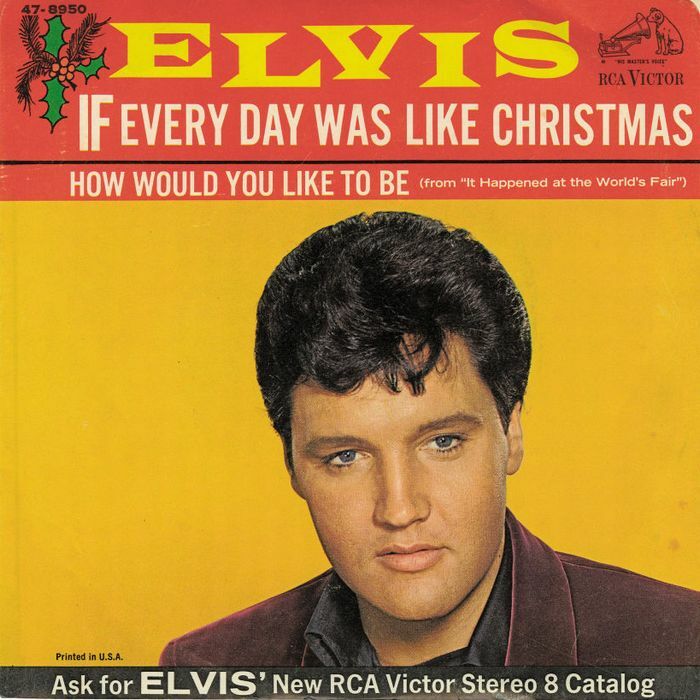 For the 60’s re-release of this title, the new photo of Elvis was used. 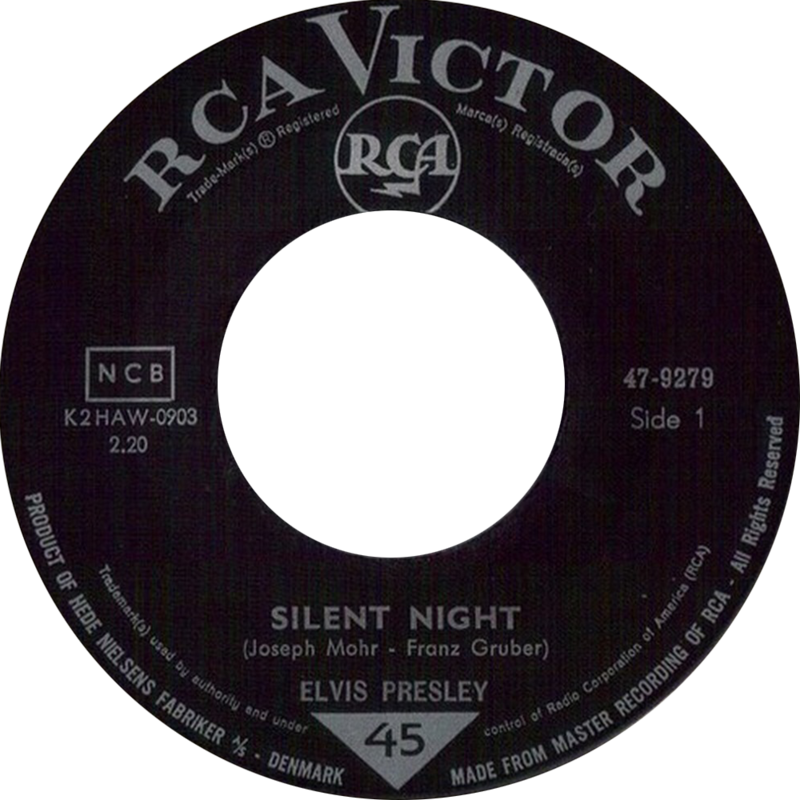 In 1965 and in 1966, two more Christmas singles were released in Germany. These two are pretty rare. 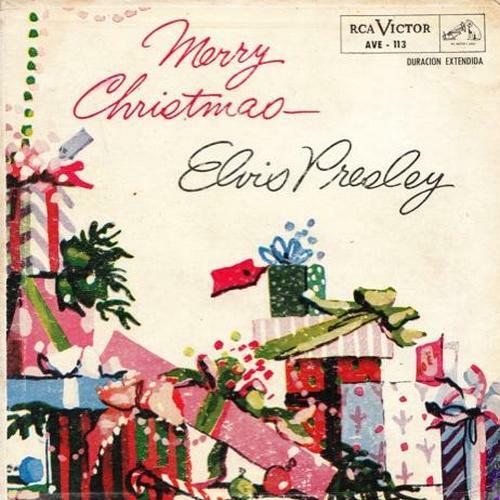 This single from 1966, was the last new German Christmas release in the 60’s. 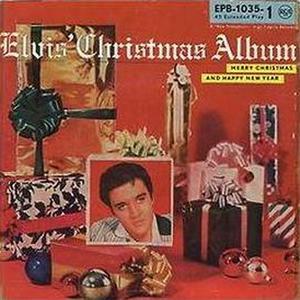 The album’s re-release in the early 60’s also featured the new cover photo. 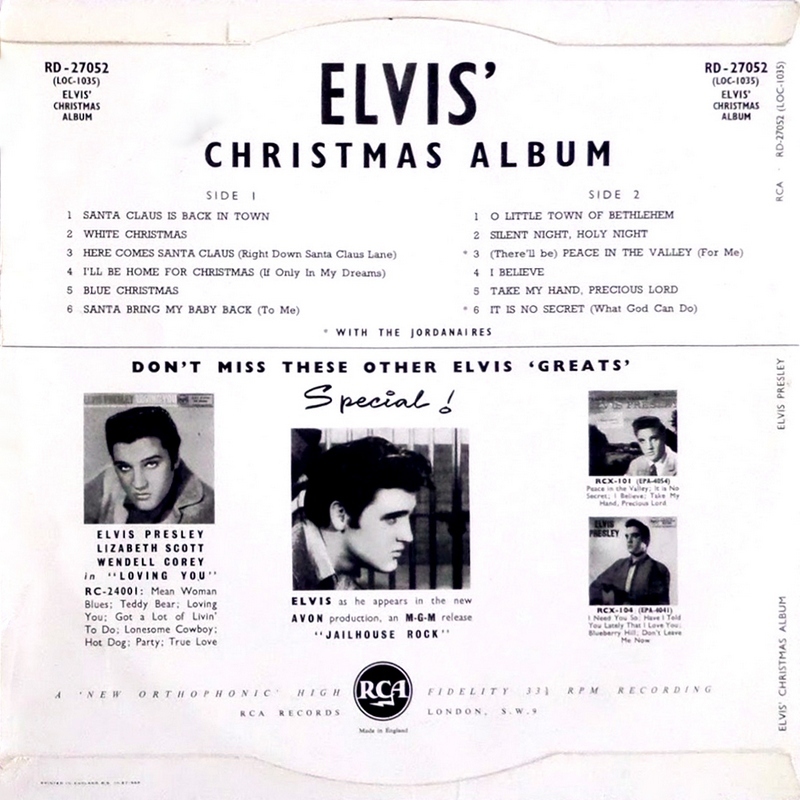 For the 1966 re-release of the album, RCA Germany used the same beautiful front- and back cover that was first seen in the USA in the late 50’s. 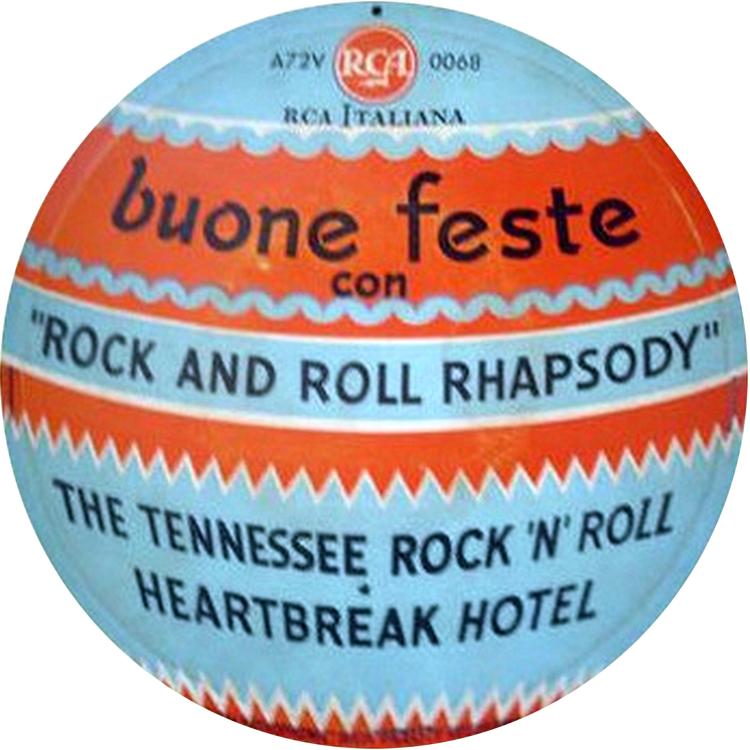 In December 1956, RCA in Italy re-released the EP Rock And Roll Rhapsody (which included 1 Elvis track) as a special edition Christmas ornament suitable to hang in a tree. 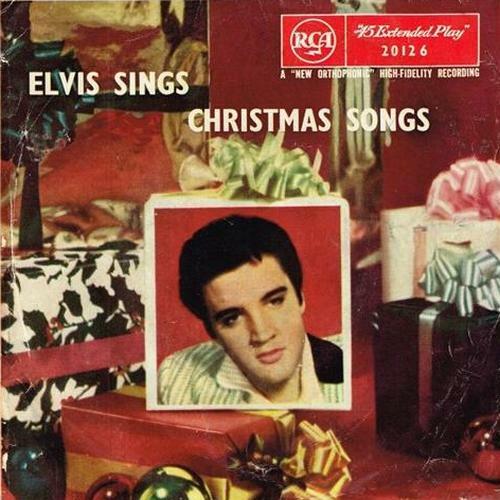 This EP is the world’s first commercial Elvis-related Christmas release. 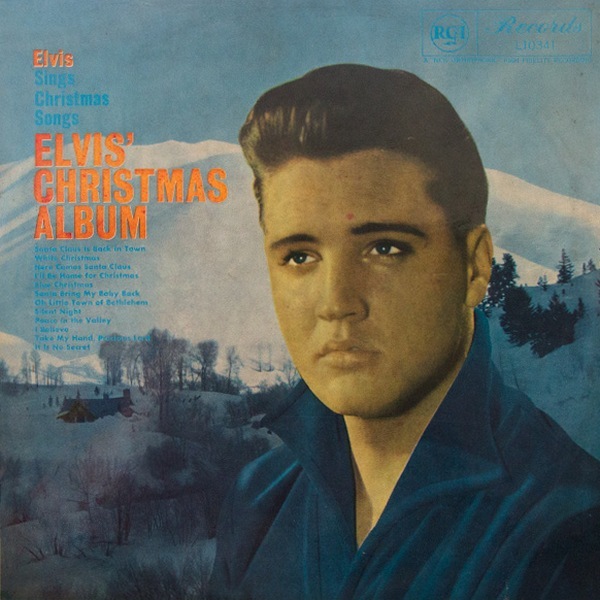 The album was released in Italy in 1958, with the US artwork. 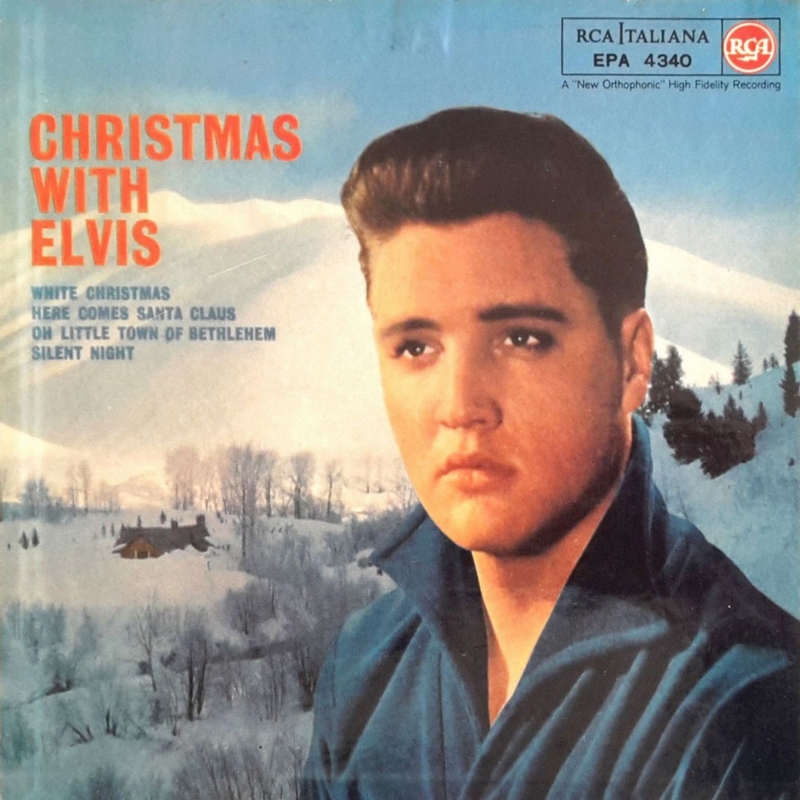 But unlike the Germans, the Italians got rid of the words “plus an album of new full colour photos” in a most professional way. 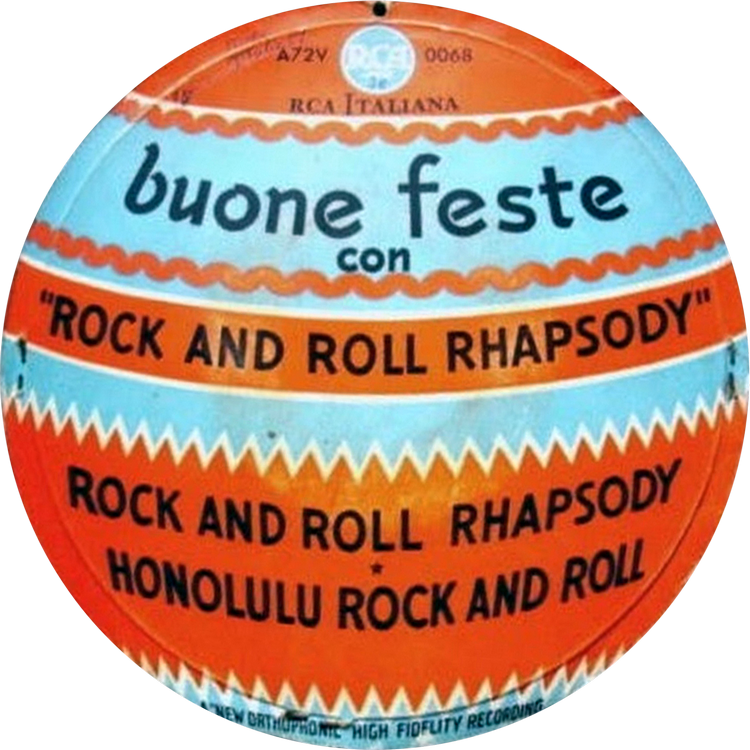 The Italian back cover was quite nice and colorful. 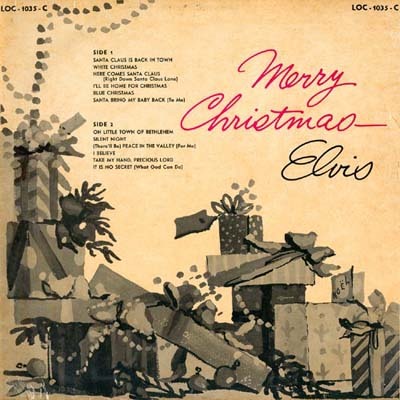 This Christmas EP, from 1959, is identical to the US release, except for the back cover. 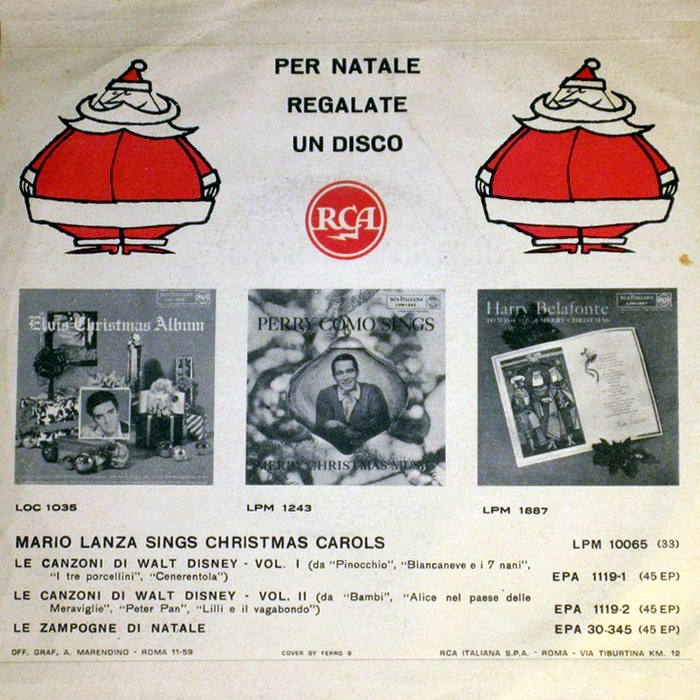 RCA Italy is known for its often unique artwork, and here we have an awesome Christmas single from 1959. 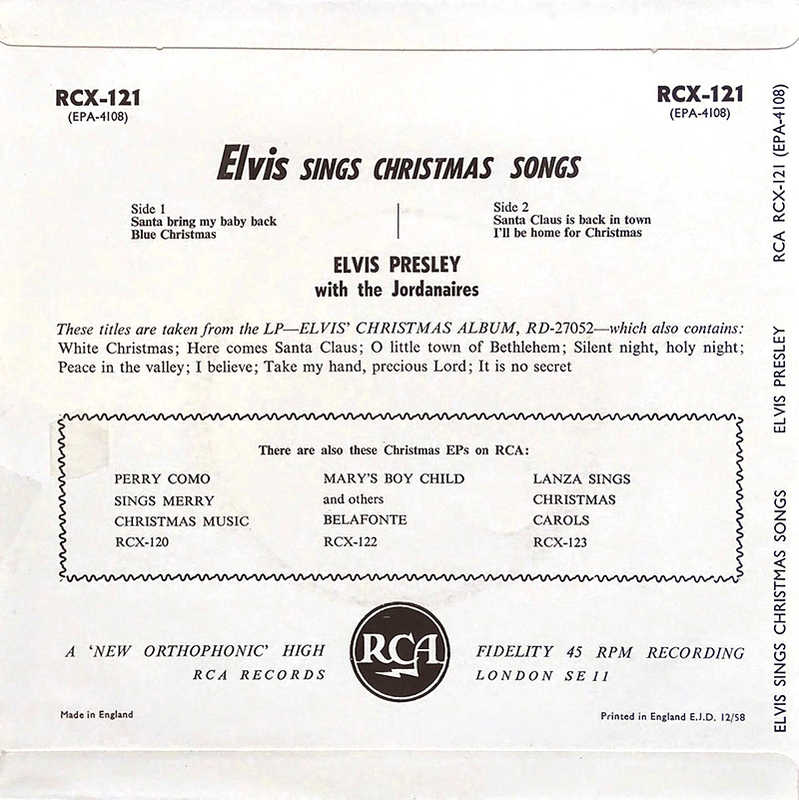 The back cover shows us the Christmas albums of RCA’s three biggest sellers: Presley, Como and Belafonte. 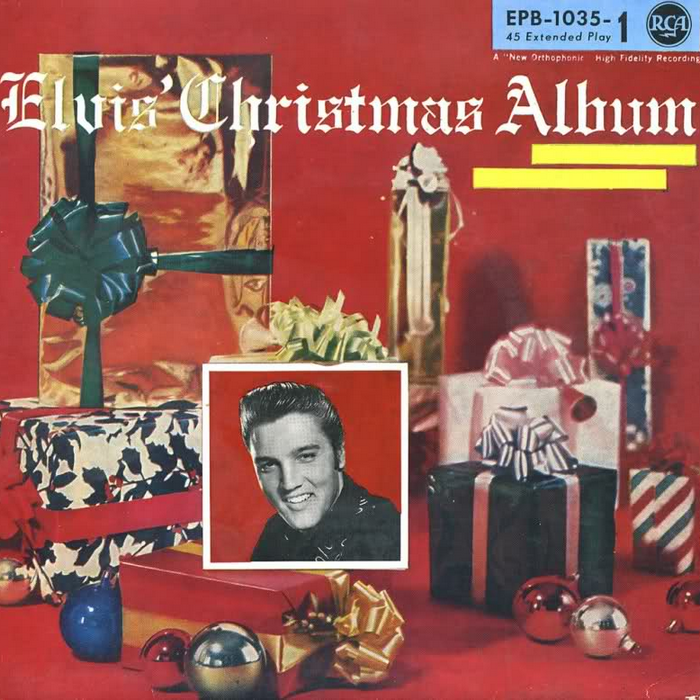 Released in 1960, notice how the titles on the front and the back don’t match. 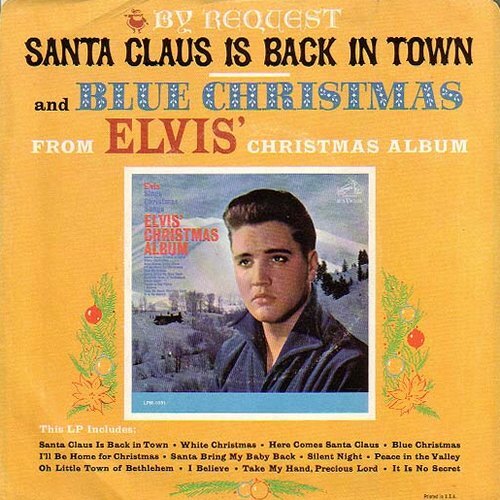 White Christmas is not on this EP, Santa Bring My Baby Back is. 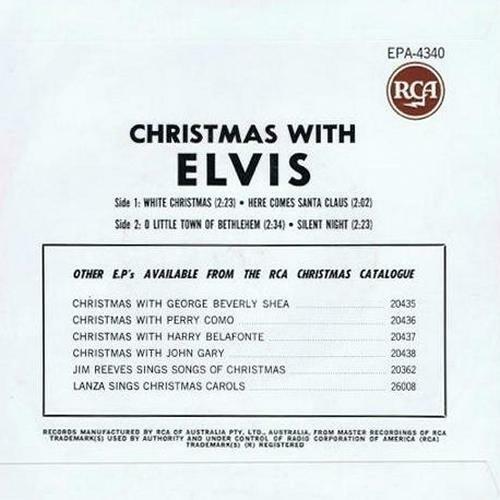 The backcover also lists Christmas With Elvis as EPA 4344, but the correct number actually is EPA 4340. 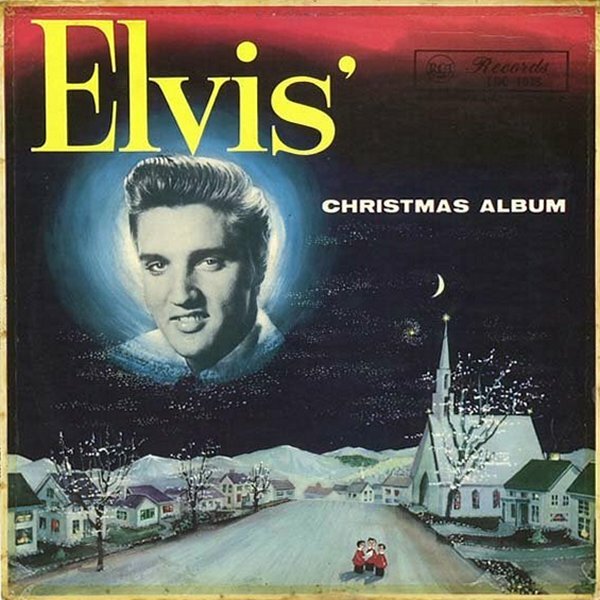 Released in 1957, this very unique album! 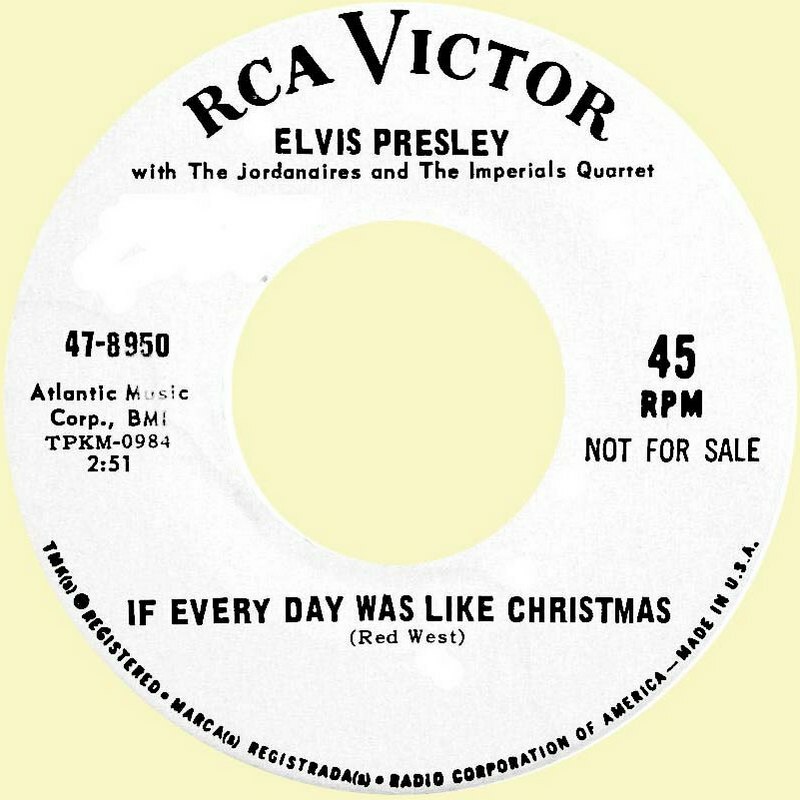 Released in both the 78 rpm (SS-321) and 45 rpm (SS-1045) format, this single from 1957. 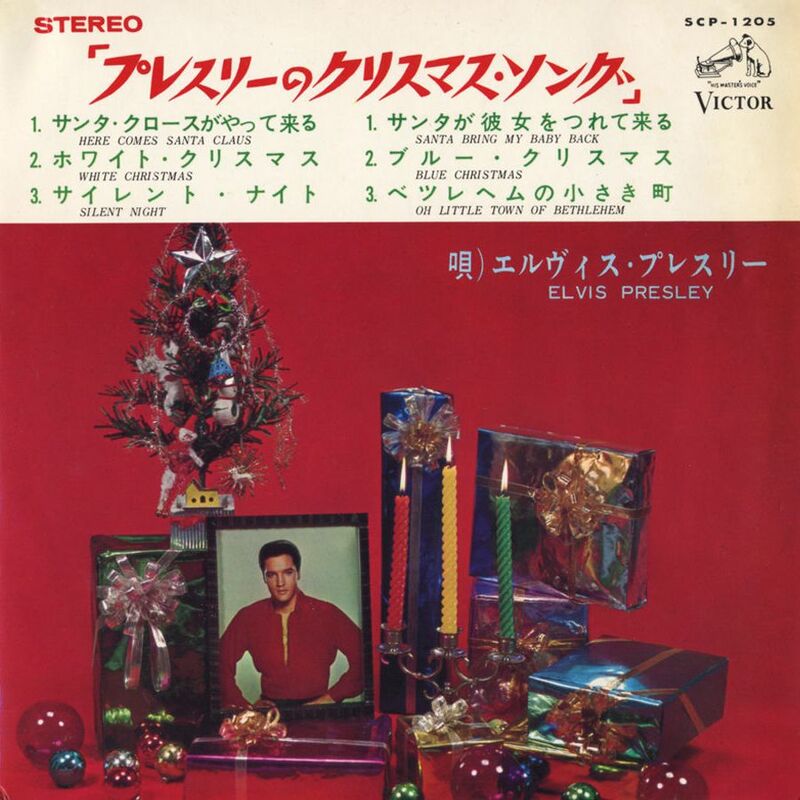 RCA Victor in Japan released this Christmas EP in 1958, however, not with the regular 4 songs (as was done around the world) but with no less than 6 songs. 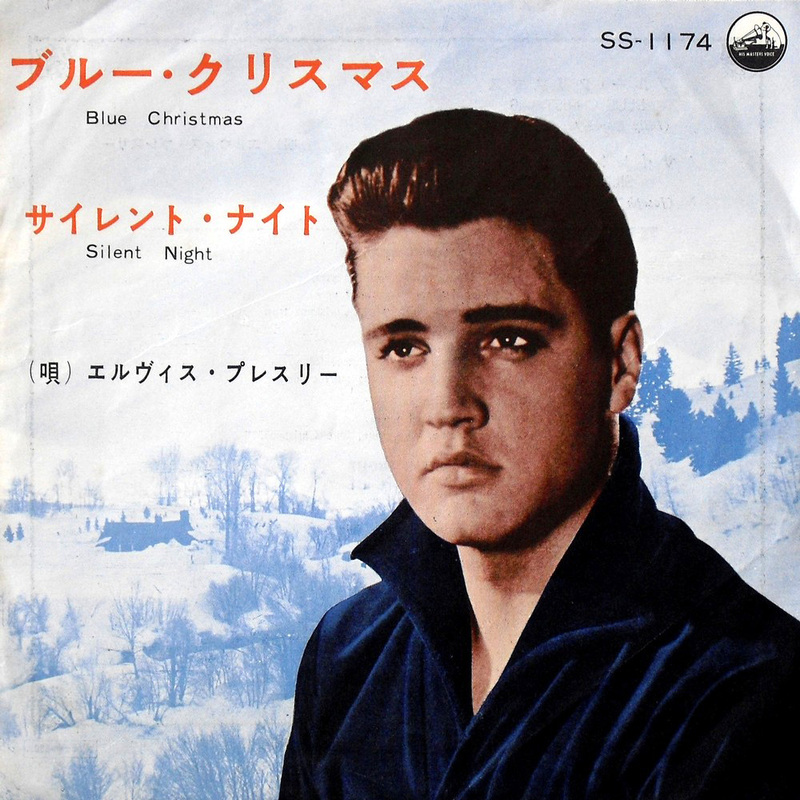 For the 3rd year in a row, from 1959, a Christmas release in Japan. 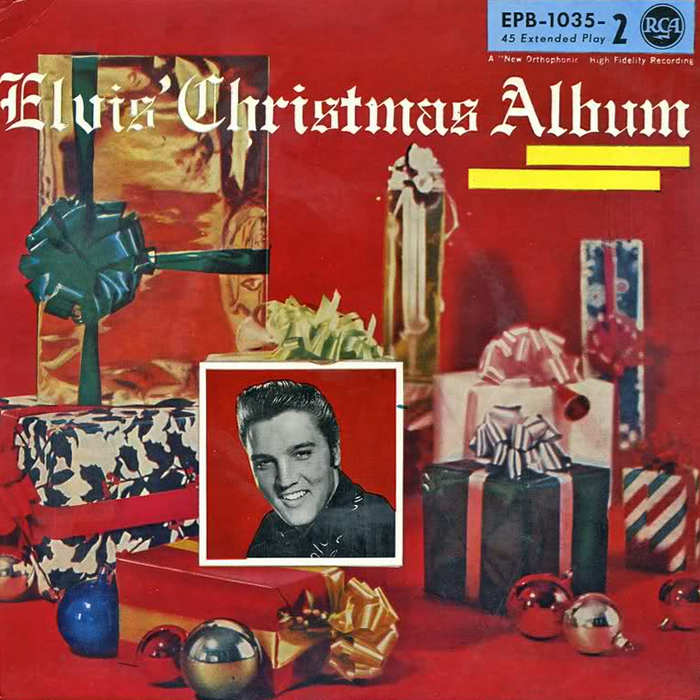 This EP from 1962, contains 4 of the songs of the 1958 Christmas EP. 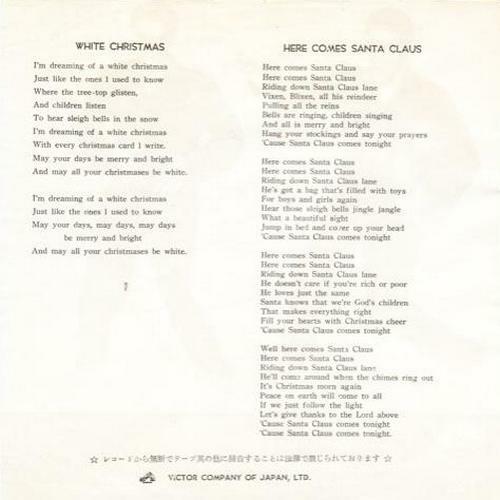 In 1965, RCA Japan released a single with a cover that was very reminiscent of the original Christmas album. 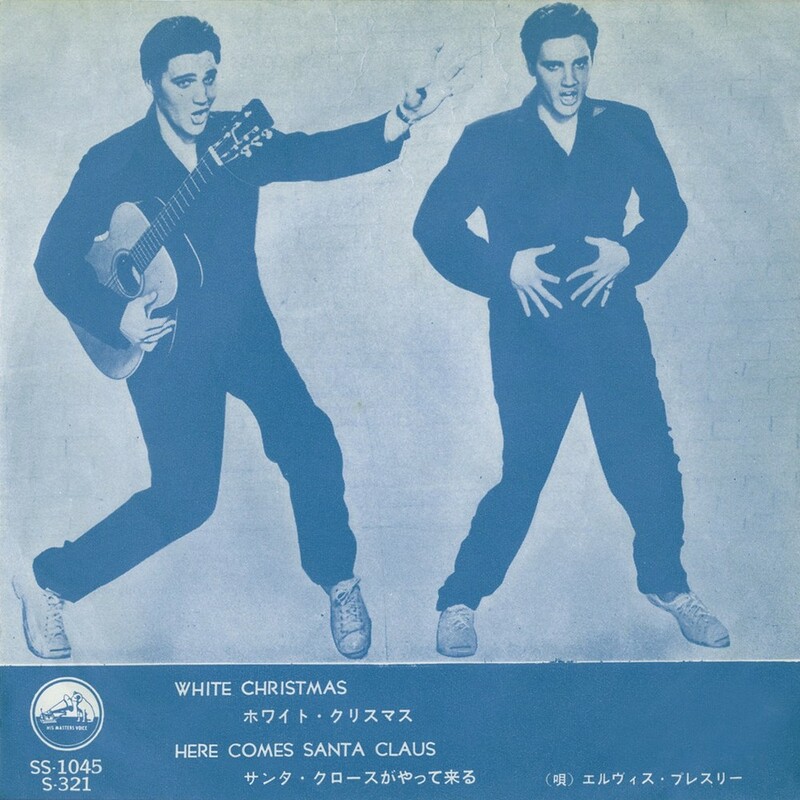 Using the same cover design, the Japanese Christmas EP from 1958 was re-released a second time, but this time with all 6 songs. 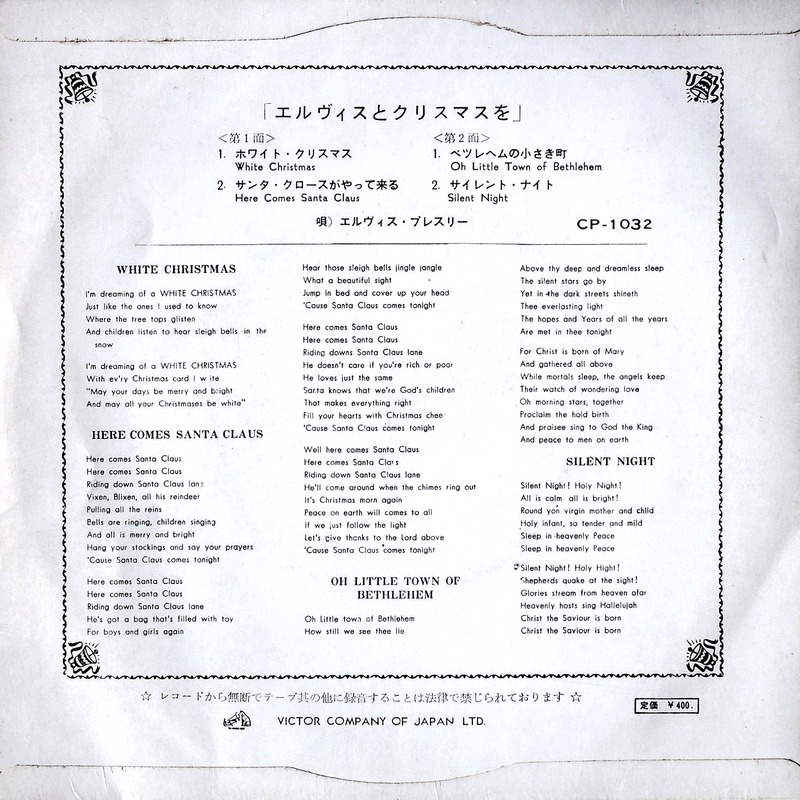 The (by 1965) classic Christmas album was also re-released in Japan in 1965, with a new front- and back cover. 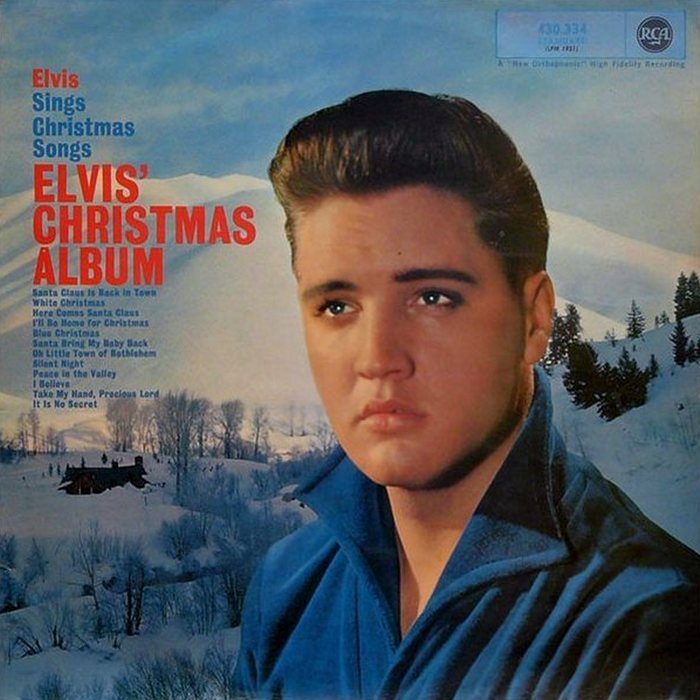 From 1957: one of the most beautiful and rarest Elvis albums in the world! 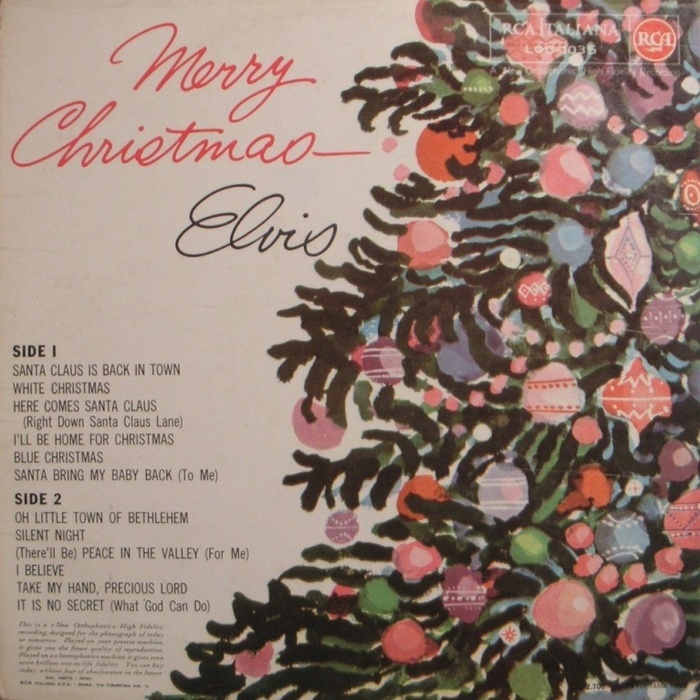 Both US Christmas EP’s were released in New Zealand in the late 50’s. 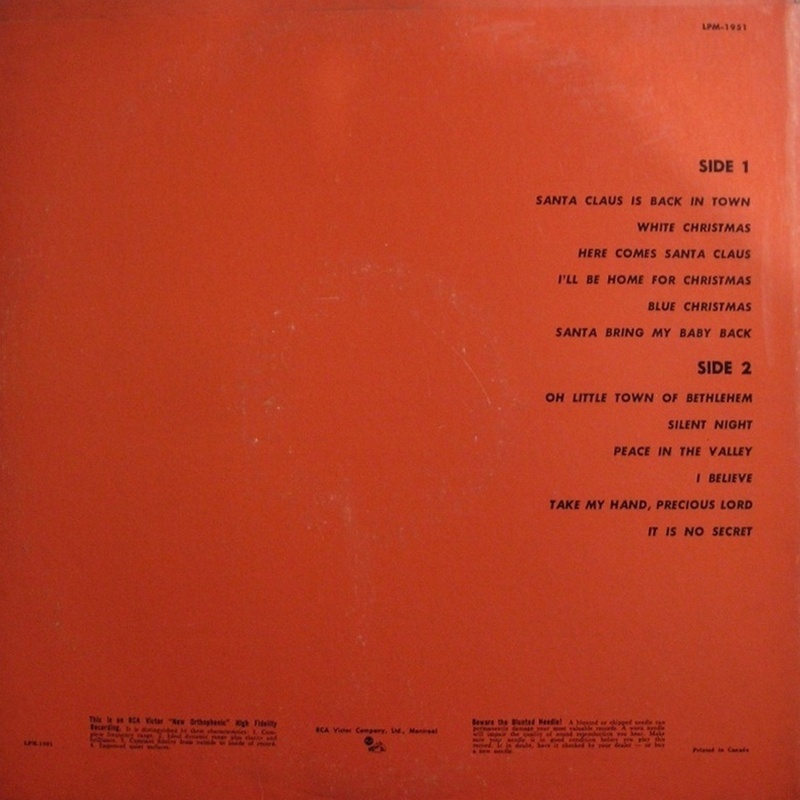 Unlike the unique cover of the New Zealandic LP, the covers of the two EP’s that were released in this country resembled their US counterparts. 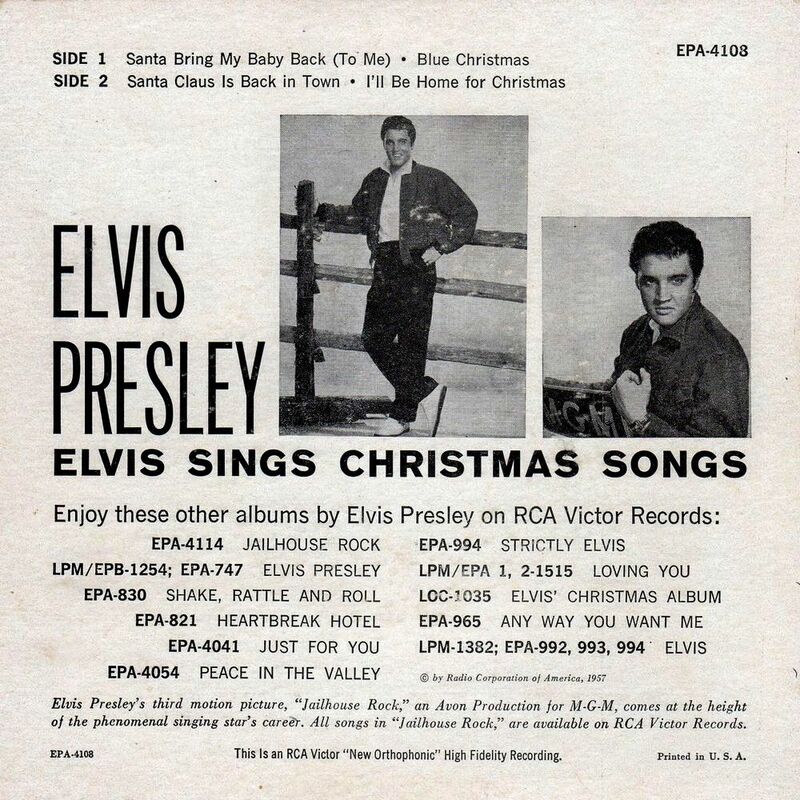 Going by the presence of the Touch Of Gold EP’s on the back cover, these EP’s appear to be from 1959. 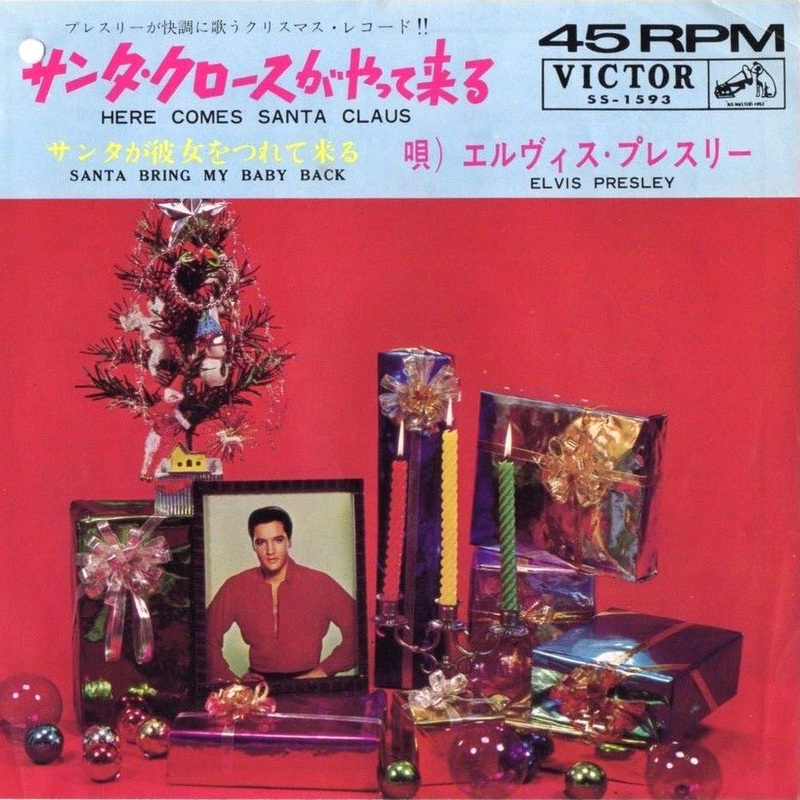 Here we have the mega rare and totally unique South African variation of the Christmas album! 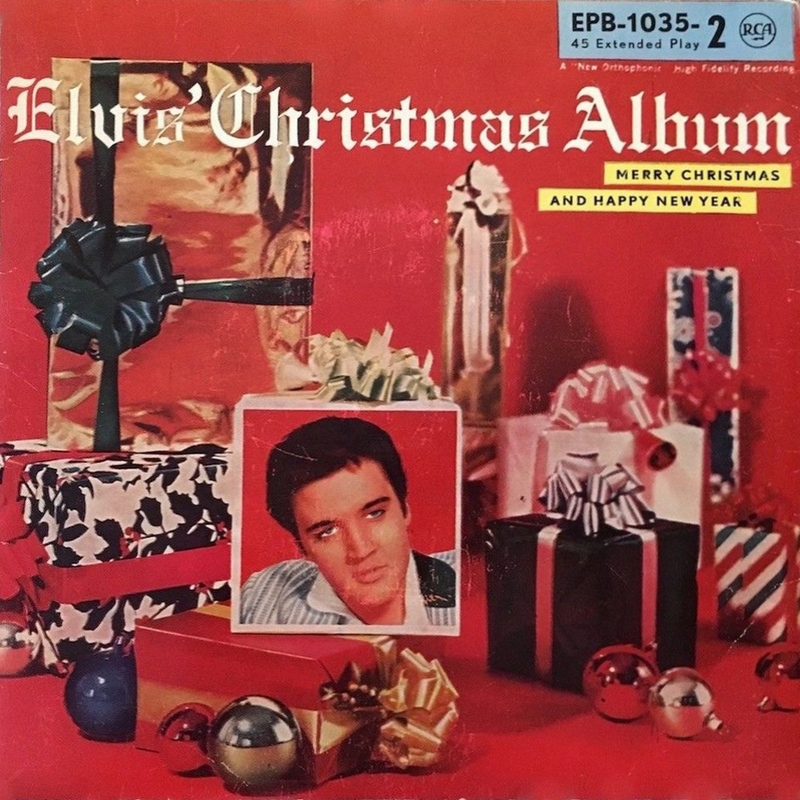 The LP was re-released with the same catalog number, but with the original US front-cover. 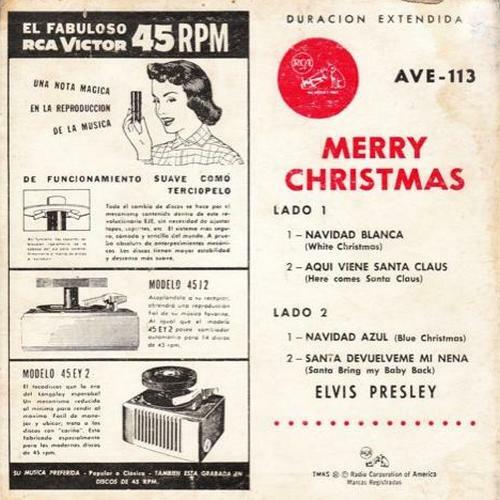 Another unique EP, only released in Spain, in 1967. 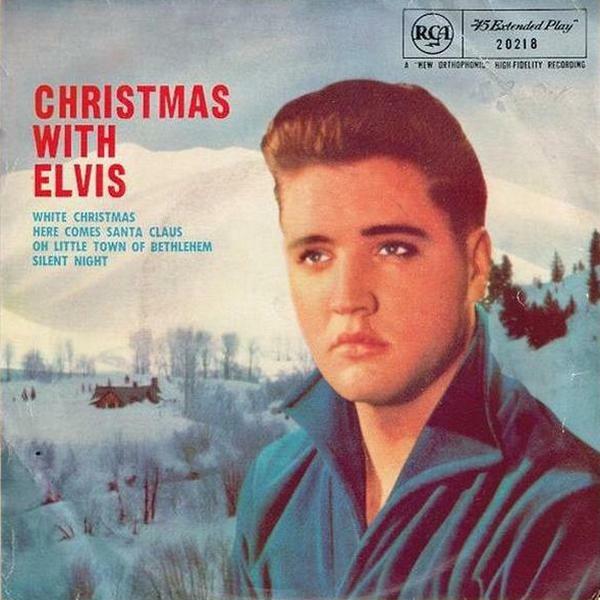 The Brits also had a totally different cover for their X-mas album in 1957. 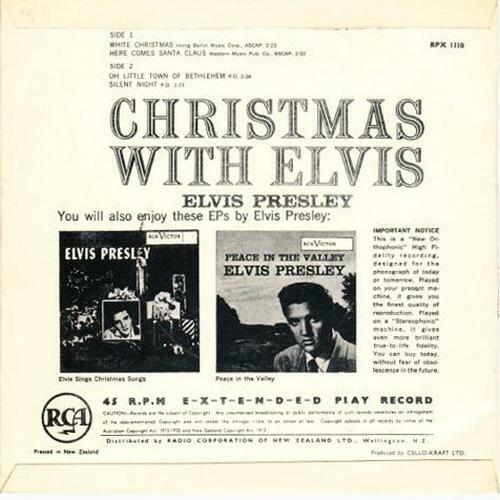 Not just the UK Christmas album, but also the British variation of the EP Elvis Sings Christmas Songs came with a different artwork when it was released in 1958. 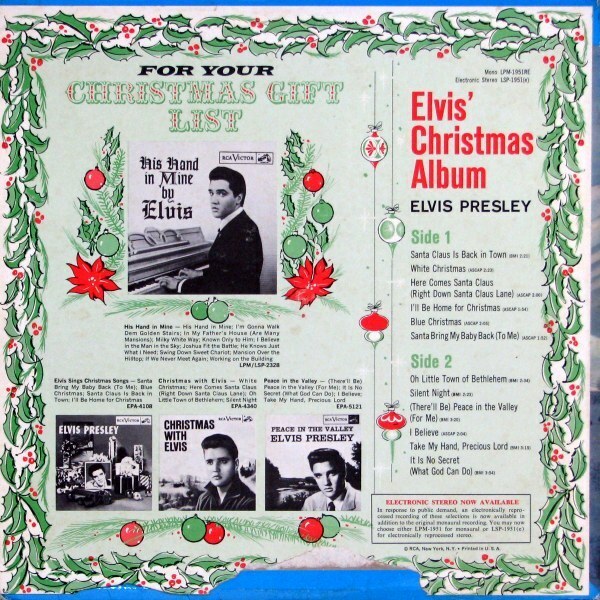 This EP was also released with a special fold out cover that offered the opportunity to present the EP as a gift (with “To …” and “From …”) which was reminiscent of the sticker on the front of the US album. 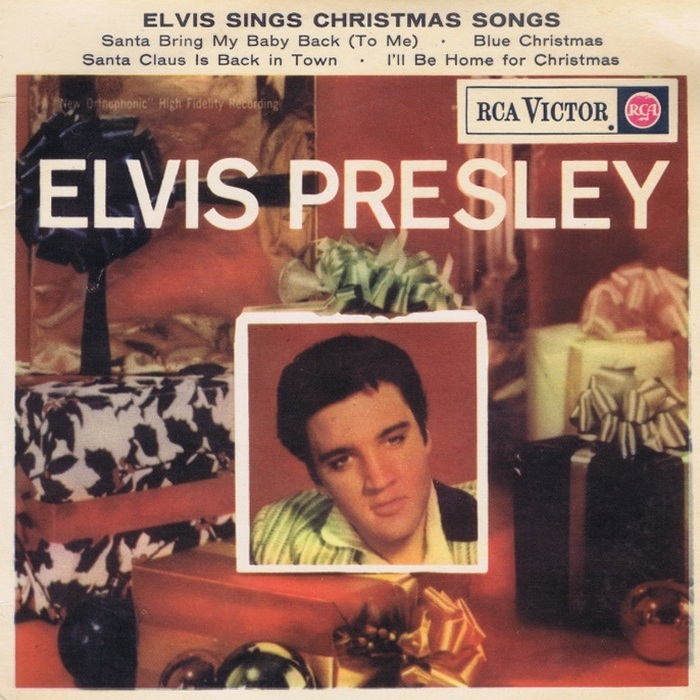 The Christmas message on the front cover, wrongly gave the impression that this might be the title of this EP. 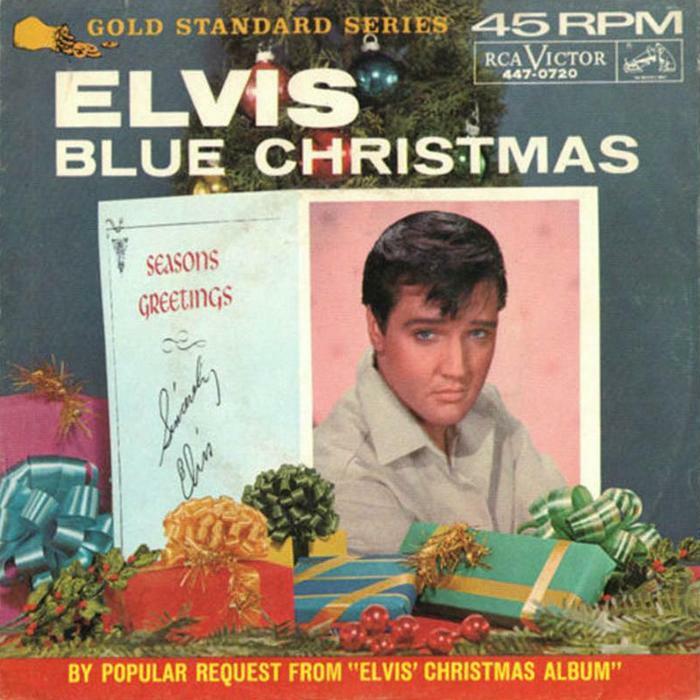 Another rare beauty, this EP from 1958. 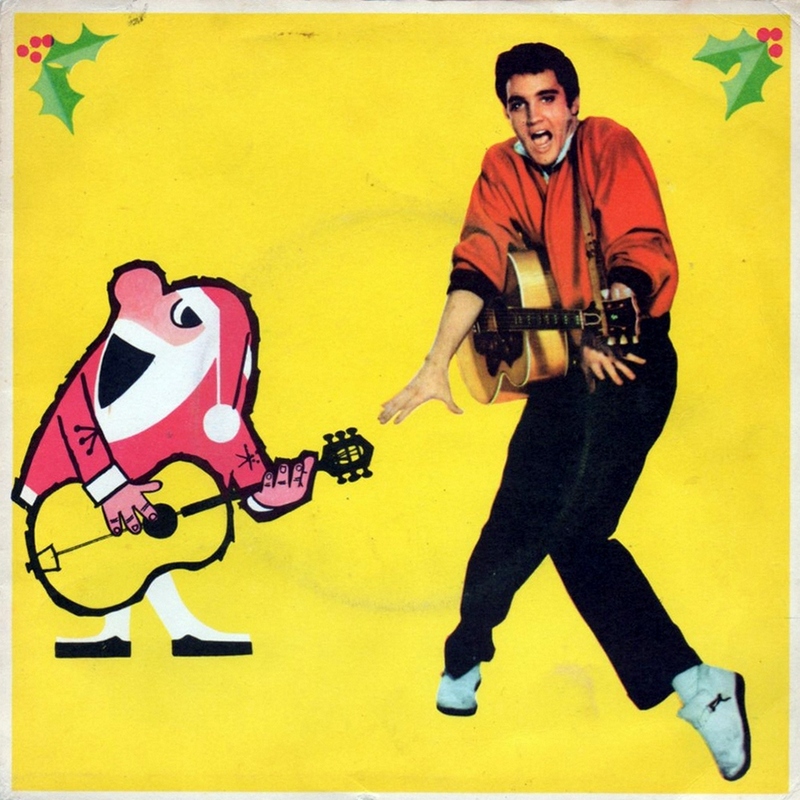 Also released in Brazil in the exact same style. That was excellent Bob. 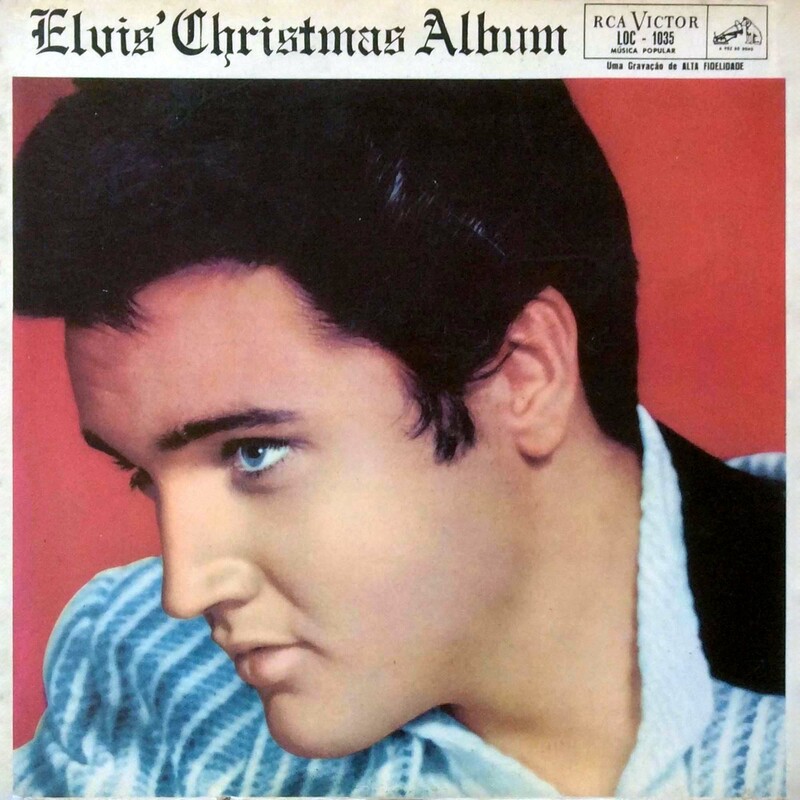 Thank you very much for adding these great vintage vinyl records to look at. 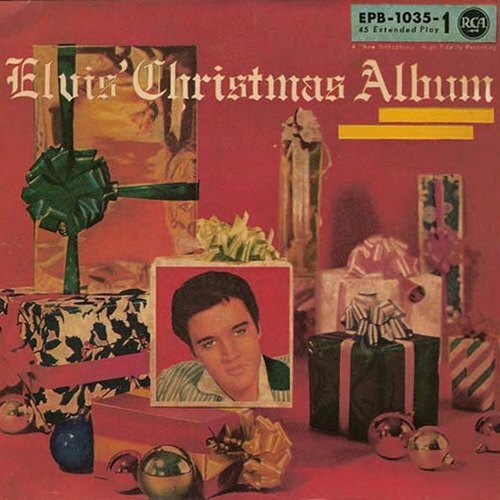 I have many of these in my Elvis collection. 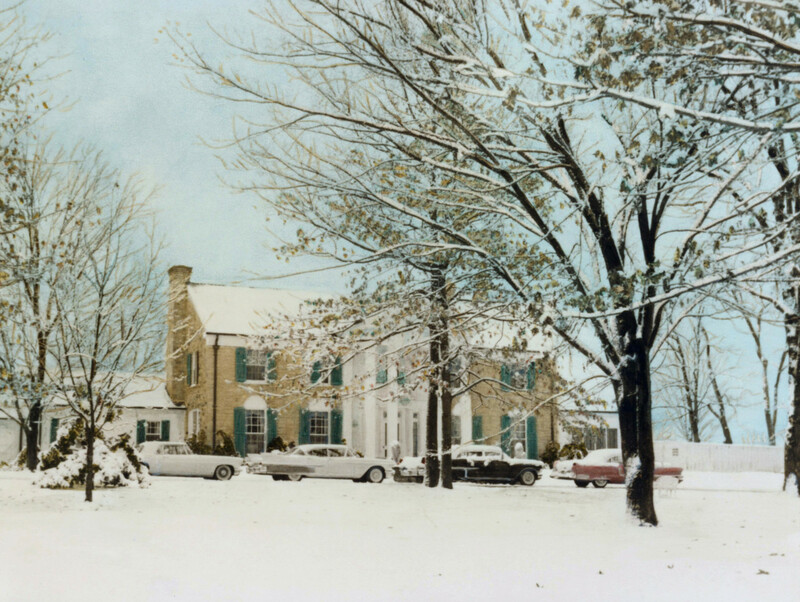 Nice collection with great pictures. Thanks for all these variations. Fantastic! 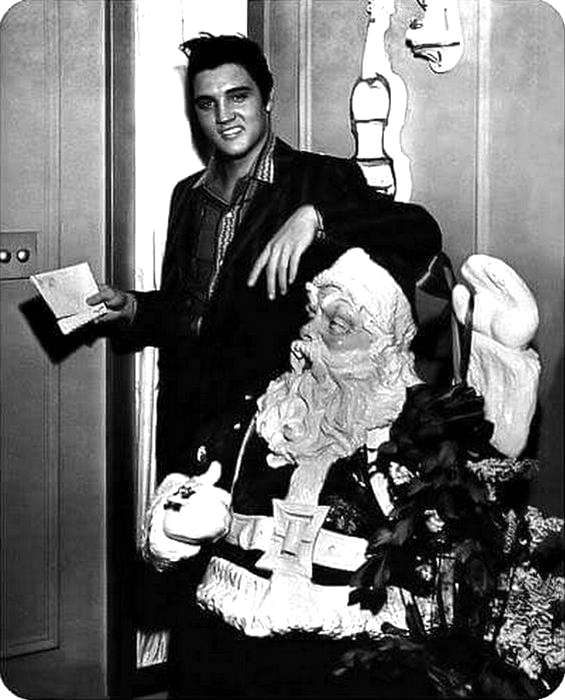 Would love to find these under my Christmas tree! 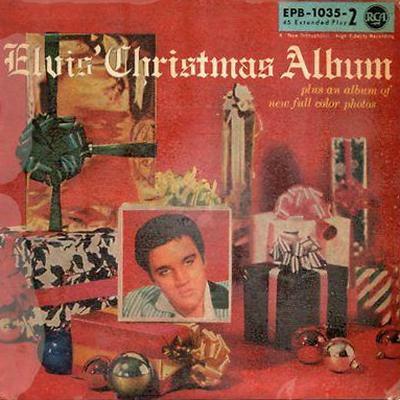 I have in my collection the German LP LOC 1035 with the EP 9644 photo and a bright gold bar covering the letters. 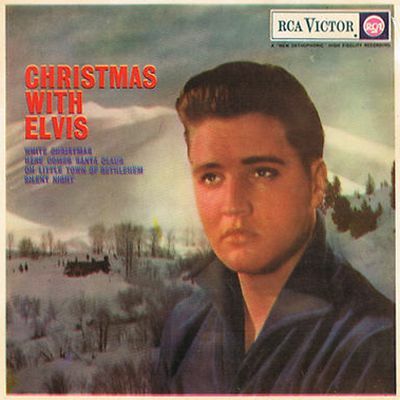 I think it’s a re-release from around 1961-62 when I bought this LP. 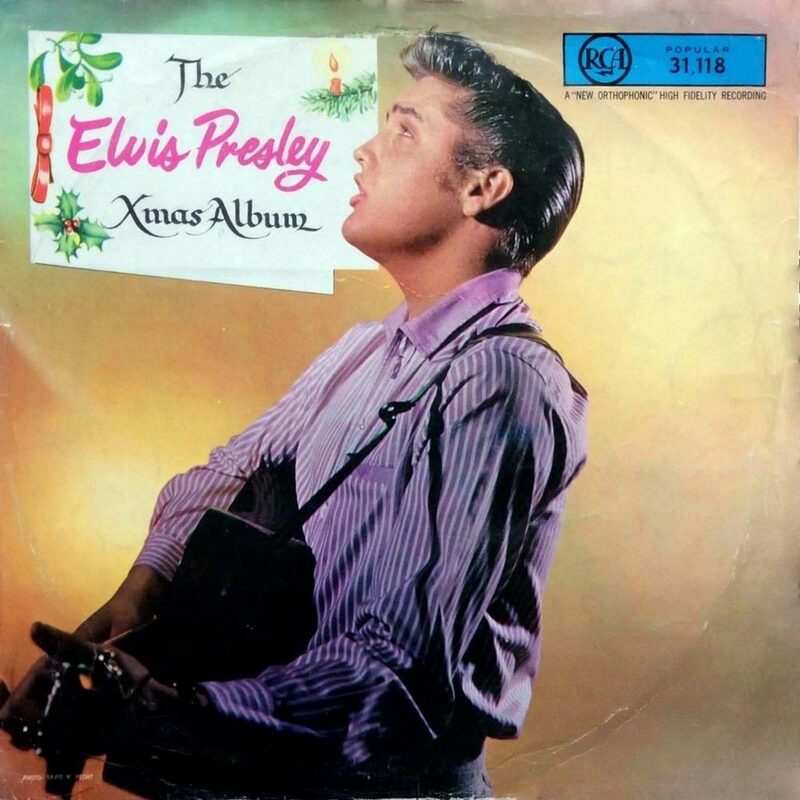 The LP has a great sound in spite the age of more then 50 years. I would love to have the album from South-Africa, it’s so beautiful. 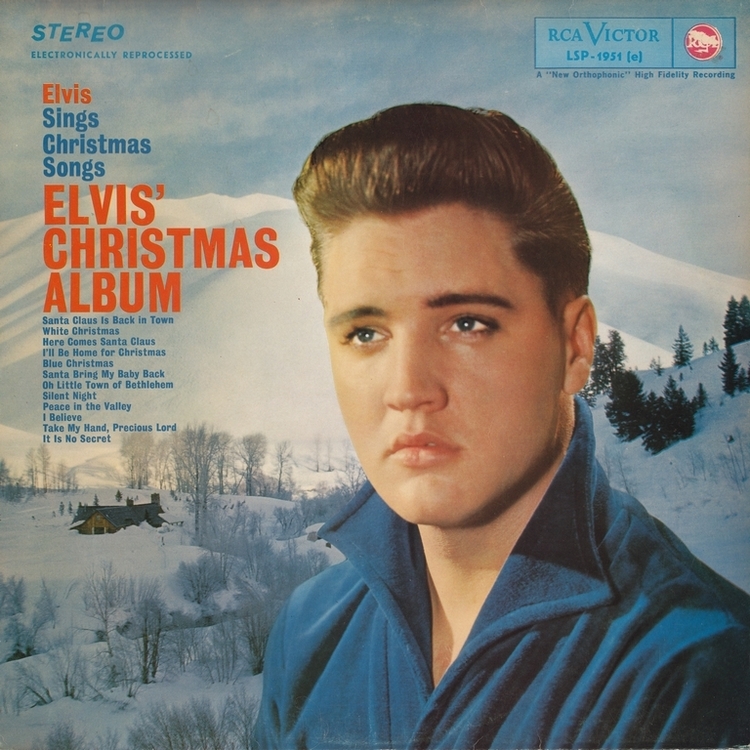 I got the LP from New Zealand but it’s not the original. 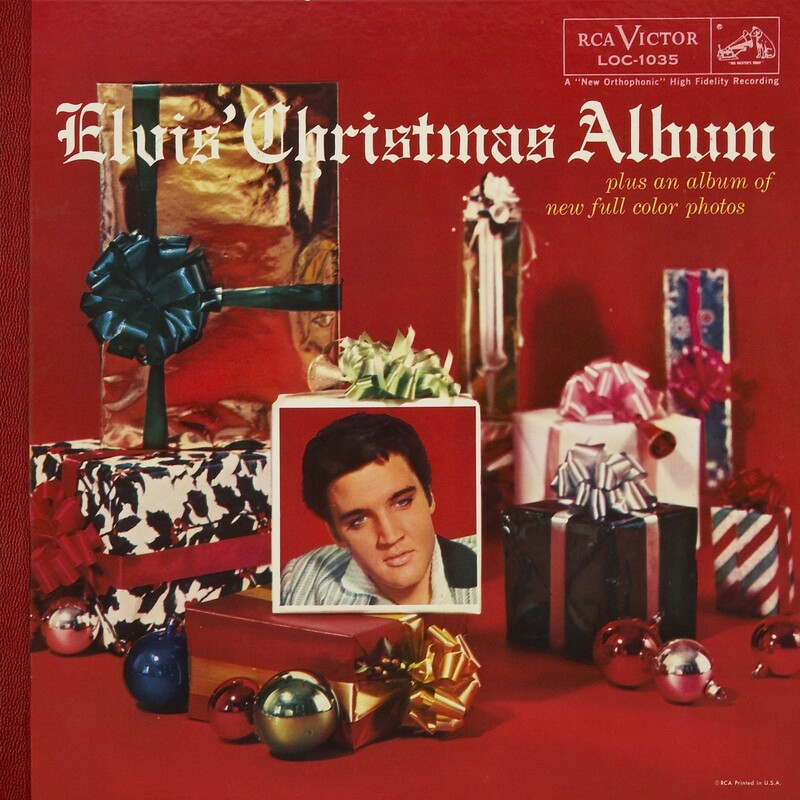 I just bought it for the cover and I got in a frame and it’s up every Christmas just for that cover. 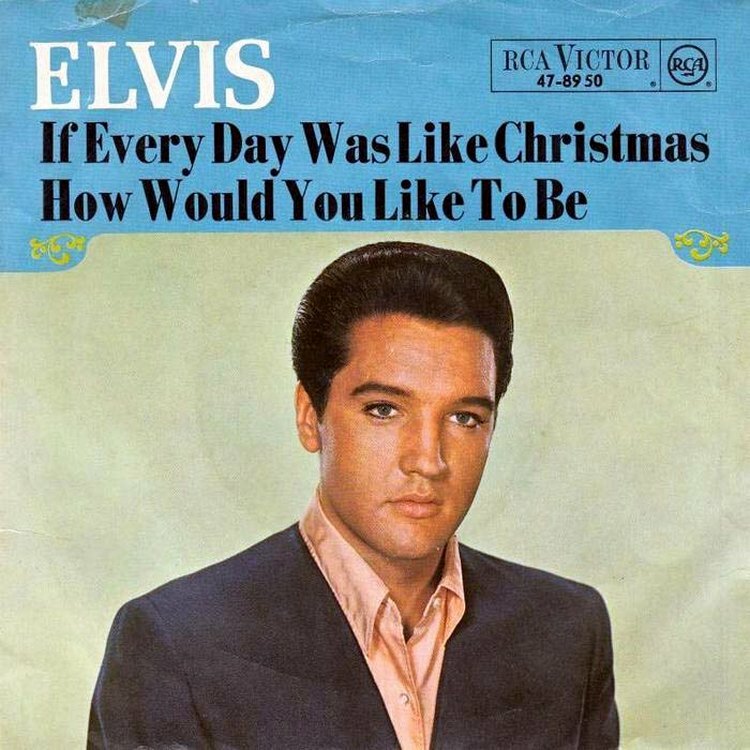 Wish I could own the original. Super array of some very nice records. Thanks! 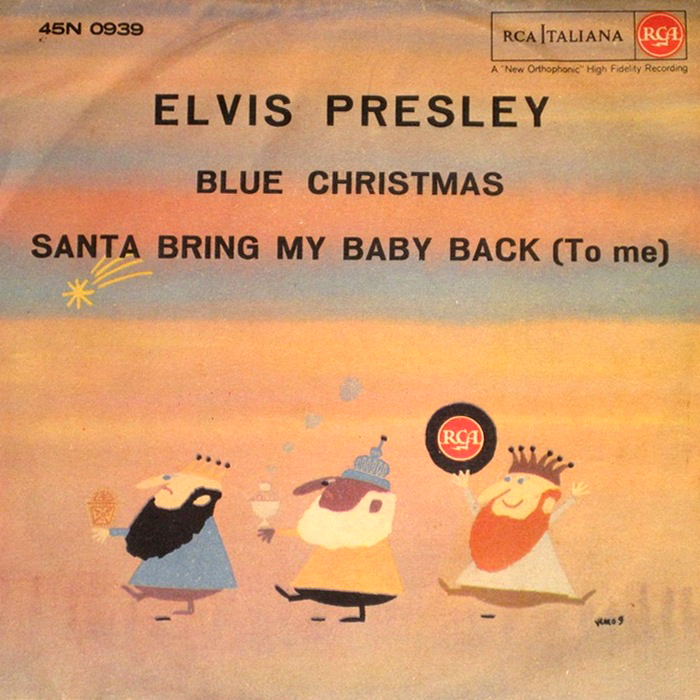 I love the artwork on the Italian single of Blue Christmas, really cool. Thanks for another great article! 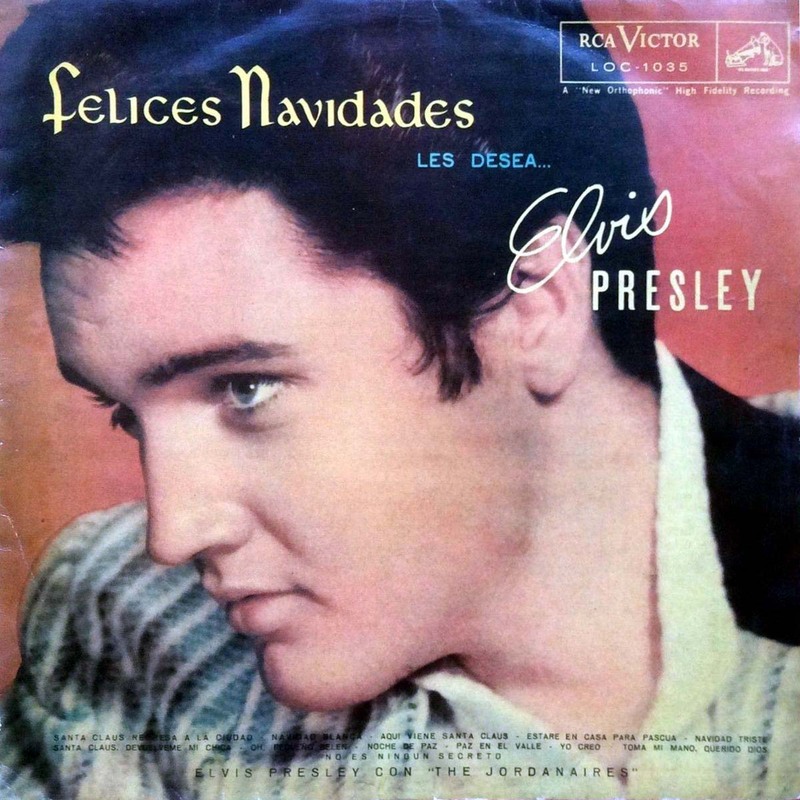 I’m after the Elvis Presley Christmas LP from Chile. Please let me know if you can get me one. Amazing work and collection. Thank you! Very Nice to see these together.